Why throw a back to school party? With your kiddos heading back to school, you’re facing a wealth of emotions: happiness, sadness, excitement, and maybe even nervousness of what the new school year will bring. Have you ever thought of kicking off the new school year with a BANG by throwing a back to school party? Today’s blog has got you covered with more than 60 exciting back to school party themes and ideas for a pint-size party-goer shindig that will be remembered from the moment they walk in their first day, until graduation. 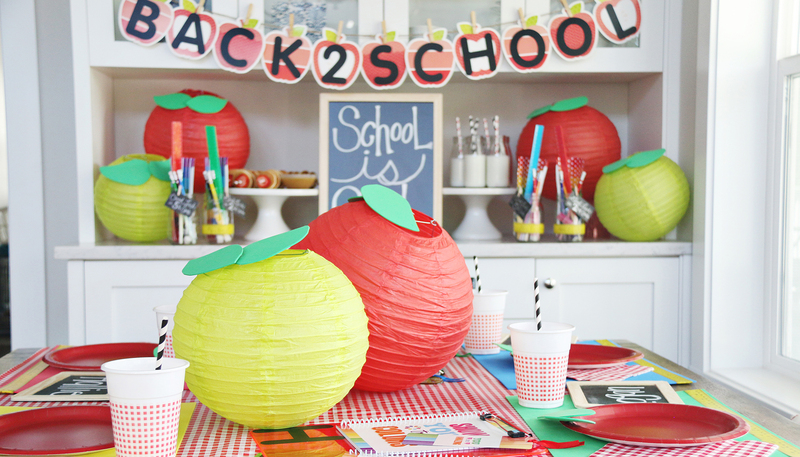 From apples to rockets—we’re bringing it all up in this A+ Back to School Party Planning Guide. Let’s take a second and appreciate all the hard work that teachers put into their classroom themes each year and how awesome they make it look for the students. As you’re creating your own classroom-themed back to school party consider primary colors. Our inspiration for this theme was a chalkboard classroom (as if kids even know what that is today). This adorable chalkboard-themed party was created by Leoni Jena of Just Call Me Martha. From the invites to the dessert table, this mom threw a back to school party that her littles wouldn’t forget. Leoni makes note that her vision for this party was her daughter’s favorite things about school: notebooks, writing, apples and reading. She did an amazing job of incorporating these elements into the theme. The invitations, envelopes, and apple stickers were from Kikki K’s stationary collection. Leoni used her budget wisely and simply painted an old table with chalkboard paint. This creative twist allows the kids to draw on the table during and after the festivities. The backdrop to the table is MDF boards, a denser wood than plywood, and was covered with the chalkboard paint. The focal point is the tree decal and you can find a similar one here. The food and dessert platters rested on mini chalkboards, and she used old books scattered around the house as decorations. Leoni is also baker and handmade the cute cake that tied in perfectly with the theme. She used chalkboard labels on the glasses from BradensGrace with paper straws—yay eco-friendly! Leoni says, “The best thing about the blackboard paint on the table and walls is that I could use both surfaces as giant “labels” for my sweet goodies. Any excuse to write on walls and furniture,” and we agree! We adored this personal detail and it made it the chalkboard classroom theme come to life. Apples are the most symbolic item about school so why not base a whole back to school party around the notorious gift for teacher? 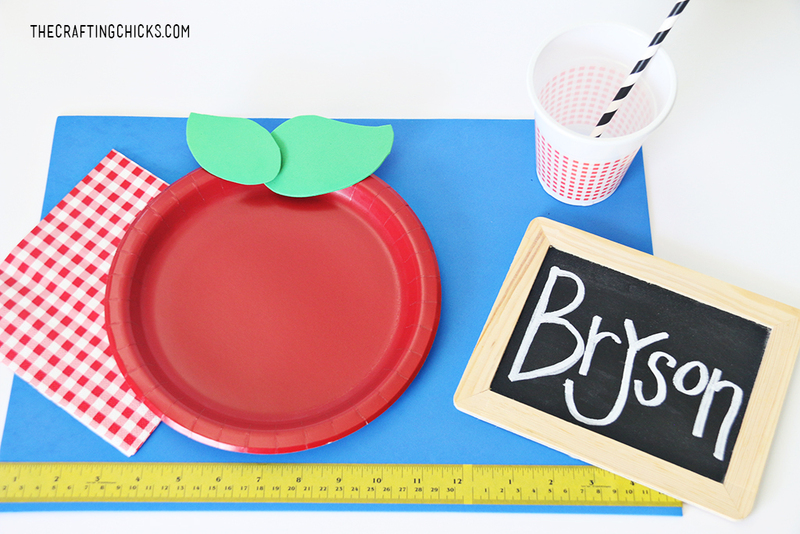 Jamie from Crafting Chicks inspired us with her back to school apple-themed plates and décor. This party is bright and cheery, crisp and clean—just as apples should be. 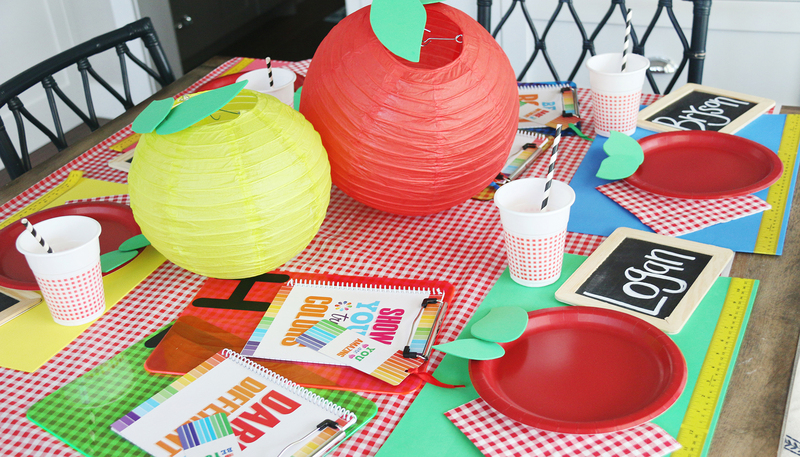 We’ll walk you through how Jamie created this adorable apple-themed back to school party. The place settings were extra special with the red apple plates, red gingham napkins and chalkboard name tags. She created the apple plate using a red party plate and glued green foam that was cut into the shape of a leaf onto the plate. The placemats were foam sheets that were lined with ruler tape (Jamie added this for a little pizzazz). The gingham napkins tie in perfectly with the plates and we adored the chalkboard with the child’s name. 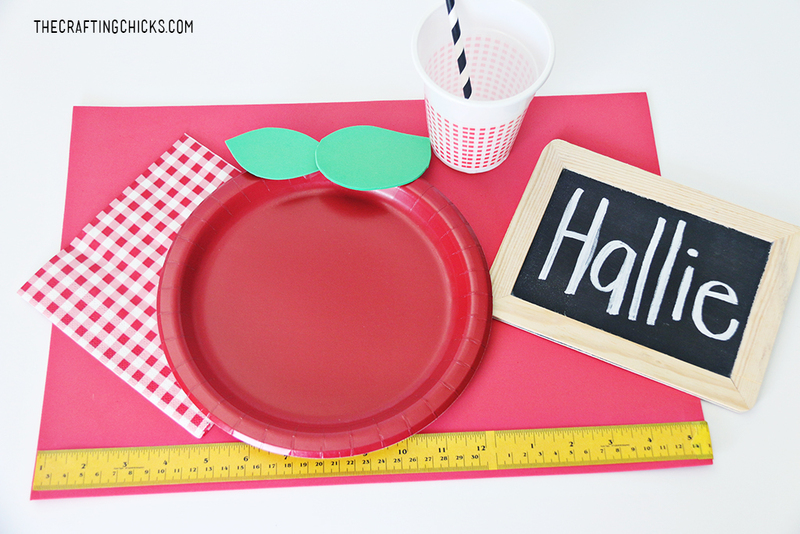 A complete how-to guide for creating apple place settings is also available for crafty moms. This back to school party wouldn’t be complete without a few decorations. She lined the table with a gingham runner to tie in the napkins. Red and green paper lanterns topped with foam leaves that were scattered around the room to represent apples. Jamie hung a back to school apple banner that was too cute. Etsy also has a ton of ideas for the apple garland. We loved the “SCHOOL IS COOL” message that she wrote on her chalkboard. You can easily recreate this by using a letter board or chalkboard that you have at home. Don’t forget the annual back to school photo. We found some apple-themed props that your child can hold before they get on the bus! We’re not sure about teachers, but we give this party an A+. One of our favorite things about starting the new school year was the brand new set of crayons that we’d snag and promptly add to our new school box. Perfectly pointed and ready to go. 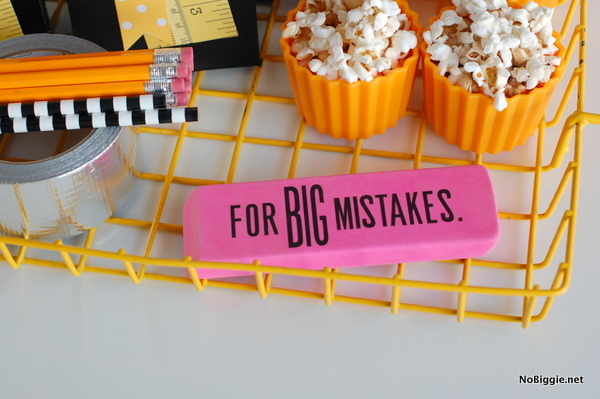 For this back to school party idea, we embraced the crayon theme with several elements. This back to school crayon banner from Mari Eugenia of Inspired by Family is a great way to great the kiddos on their first day of school at home or the classroom. Parents and teachers can easily recreate this by following her simple crayon pennant banner instructions. Leanne Schaffhauser inspired us with this DIY crayon utensil holder that could also be repurposed as vases for flowers. She recycled metal cans by hot gluing crayons along the can. She tied colorful ribbon into a bow which brought it all together. No party would be complete without snacks and Stacy of Not Just a Housewife created her own back to school crayon party complete with cupcakes. Stacy baked desserts and and added a veggie tray. Very simple for her kiddos. The cupcakes caught our eye with the adorable cupcake liners that looked like crayon wrappers; we loved the creativity! The icing matched the wrappers which made each cupcake look even more like a crayon. These simple decorations can also be accompanied with activities for the kids such as coloring (of course) and fun activities such as a scavenger hunt for school supplies from the Dating Divas. Going back to school is something to celebrate and Kami from No Biggie created a simple yet classic feel with her school bus-themed back to school party. She started by choosing the color scheme to her party: black, white and school bus yellow. She added Black Eyed Susans to her milk glass vases. When recreating your own look, you can also consider other seasonal blooms too such as daisies or sunflowers. Kami used oversized school supplies as accent decorations that she purchased from Michaels Craft Stores. She added silicon cupcake liners to hold popcorn for the kids’ snacks and threw in some Mary Jane candy because of its vintage feel. We loved the charm of this old-time favorite, and how it helped beef up the theme perfectly. The black and white background can easily be replicated using a tablecloth, which makes it easier for busy moms. Kami created the pennant banner flags using 12x12 cardstock scrapbook paper and added mailbox letters to spell out “SCHOOL”. The small toy school bus is the finishing touch for this Wheels on the Bus theme and ties all the elements together. This back to school party theme is sure to have the kiddos ready to get on the bus for their first day. 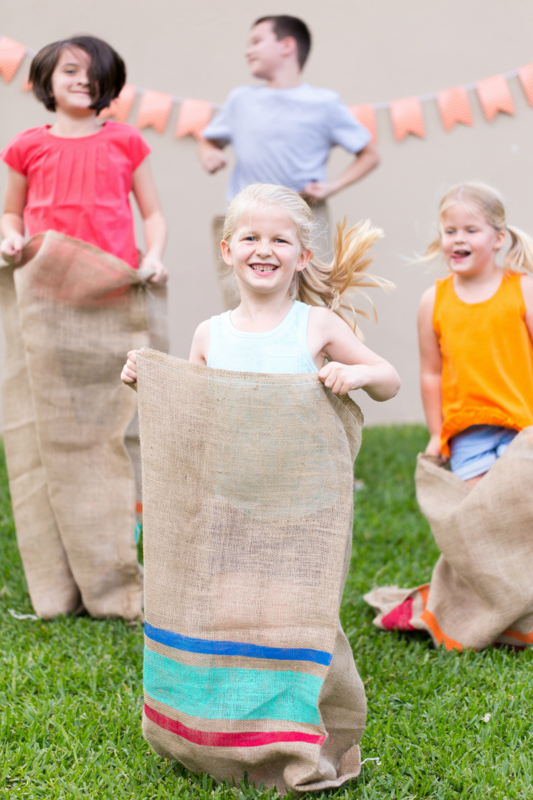 Our friends at Kids Stuff World had us leaping at the chance to tell you about their back to school party Field Day theme. Kids have tons of energy and are constantly wishing for recess during the school day but why can’t field day come early this year? With KSW’s Field Day back to school party, your kiddos will definitely sleep tight before their first day of school. 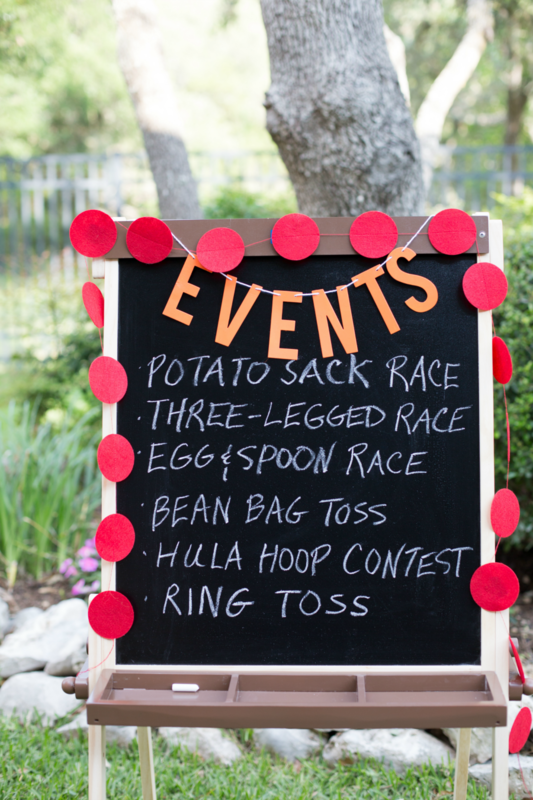 For their field day party, they posted the schedule of the events on an artist easel with the classic field day events like potato sack races, ring toss and more. They used die-cut letters and string for the word, “EVENTS”. Haeley from Designed Improvised designed the lovely striped potato sacks. Most of the games are super easy to recreate, making this a no-brainer for moms and teachers on a tight back to school party budget. 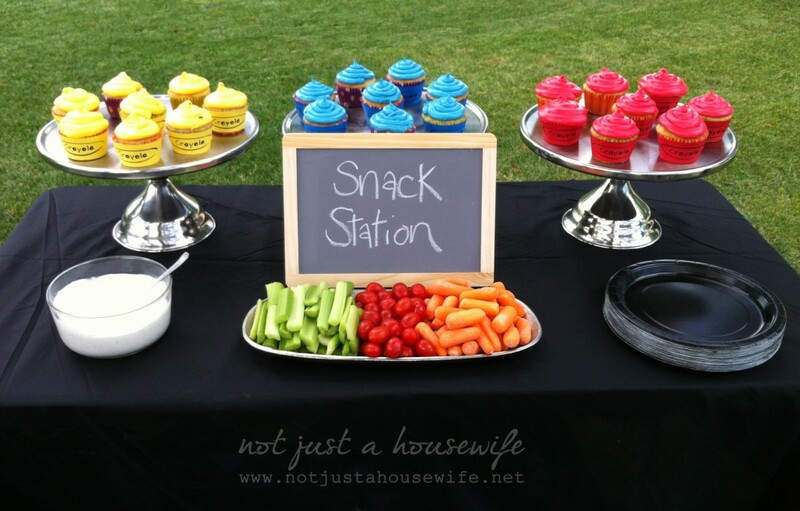 Colorful and simple finger foods and watermelon wedges on sticks were placed on the snack table—perfect for those after race tummy grumbles. They also had plenty of water and sunscreen available. Remember it’s still summer time and it gets hot out there so make sure to stay hydrated. The table decorations were very simple with pennant banners and circle banners. Balloons were at each side of the table and bubble party favors sat center stage. This field day back to school party looks like a ton of fun and brings out the competitive side of parents and kids alike. Just don’t forget the first aid kit! Calling all the superkids to this back to school party. Abby Lawson of Just a Girl and her Blog threw her son the coolest and craftiest superhero-themed party. 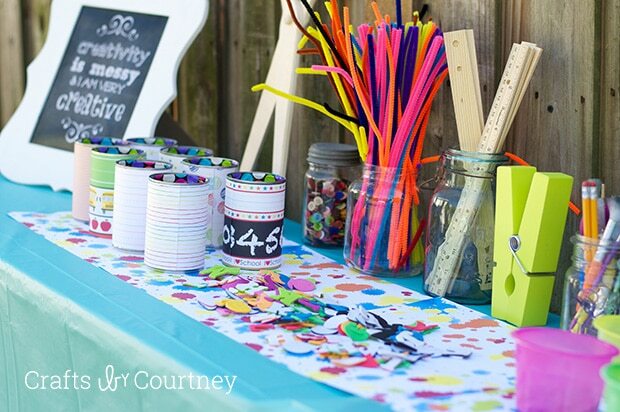 Her son may have turned 5, but you can easily repurpose these ideas for your own back to school party. Abby said that she wanted to keep it simple since it was in such a small area but her creative juices were flowing and went a little “overboard.” No chance Abby; it turned out perfectly and it looks as if your son enjoyed every moment. She decorated the cube shelf using DIY skyscrapers from folded cardboard, wrapping paper and paper that she cut and glued to form the windows. She assembled favors in superhero plastic cups for her son’s friends. She hung tissue paper pom-poms with comic book phrases like “POW” and “BANG”. There are even larger versions of these comic book cutouts that you could stick on the wall or hang from the ceiling. For table settings, she used various superheroes’ logos so that each person would have a different character. “It was fun watching people recognizing the more common ones and trying to guess some of the less-famous logos,” said Abby. 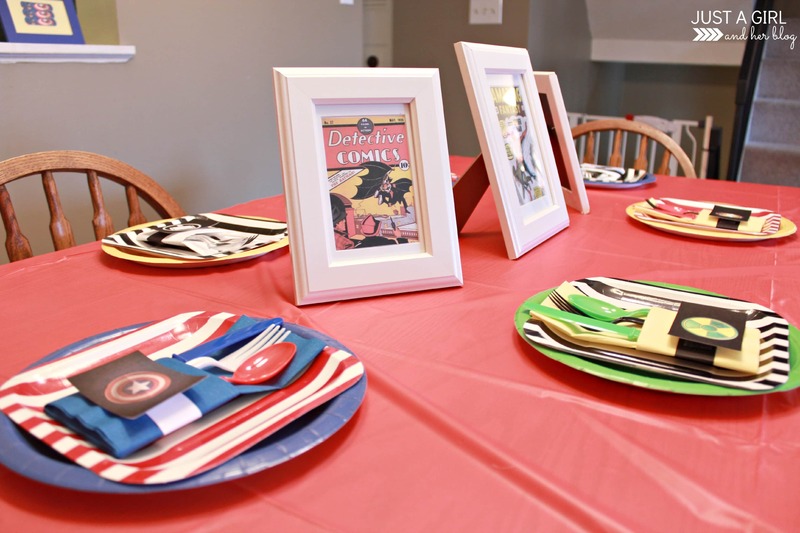 She was inspired by Bethany of Making my Stead to create vintage comic book centerpieces using her tutorial. She took her favorites and framed them to put on each table. What a creative touch! But with table settings also comes the party food. 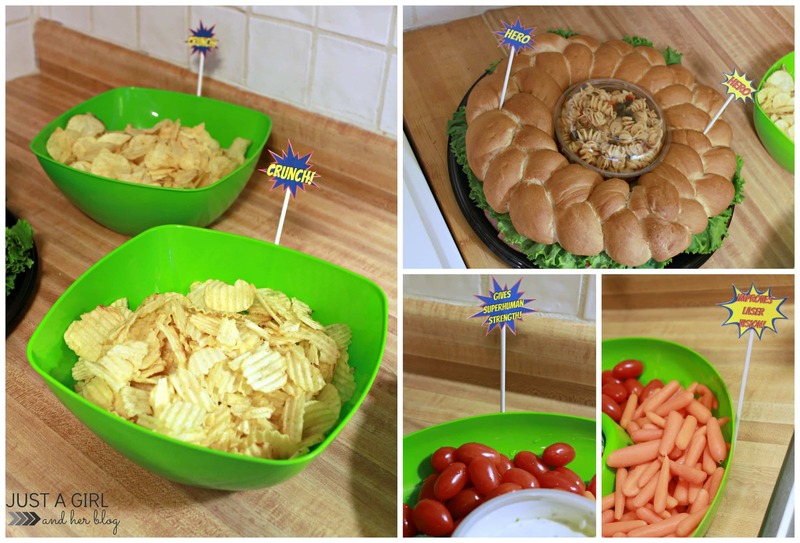 “Hero” sandwiches, chips, and a veggie tray were a simple and easy way to feed these super party-goers. Abby labeled each tray with comic book-styled art saying “crunch,” “hero,” etc. No bad guys here; this party would be a great way to KICK off the school year. Consider completing your back to school party with superhero capes for the kiddos to save the day and you’ll be a super parent! 7. Doctors, Surgeons and Nurses – Oh My! Get your scrubs ready because you’re going to need ’em for this medical-themed back to school party. We paged Dr.Vixen for this party inspiration and they delivered. 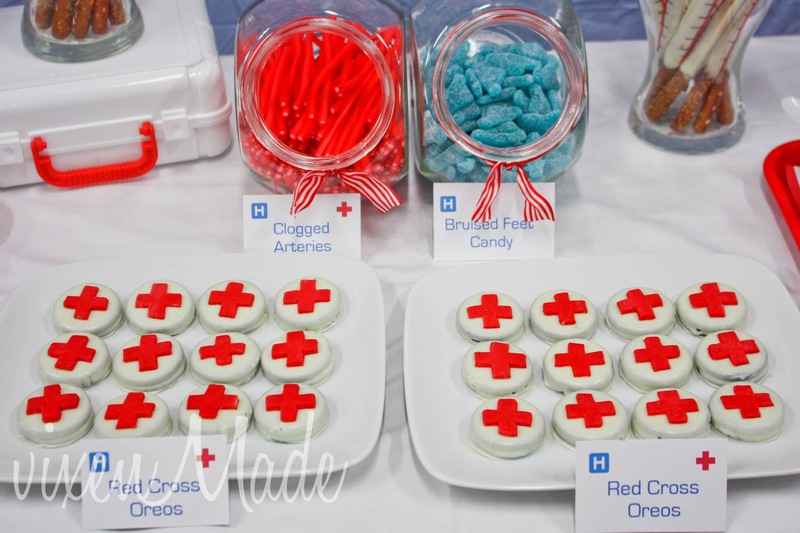 Vixenmade Parties created such a cool medical-themed party that it may even make your heart skip a beat. To keep it simple, vixenmade focused their attention on their dessert table with a blue shower curtain backdrop that resembles the hospital atmosphere. They hung a skeleton poster on the curtain to add a little decoration. You can even consider drawing red crosses on note cards (or using wasabi tape) and attaching them to a string for a garland. Blue Jello because what is a hospital without jello? Vixenmade printed basic labels and added red-striped ribbon to the containers. You can also add red plastic cups and put a Band-Aid on each one to write names. You can pick up a large pack at any dollar store or if your child has a favorite cartoon character you can incorporate those too! Code Clear: this back to school party is ready to go. Remember to ask your guests to show up in scrubs or other medical outfits to add to the fun! 8. It's a Zoo in Here! Having kids makes your house feel like a zoo—trust us we know. But why not throw a back to school party for your little monkeys? Put your safari hat on and grab some binoculars because this party is one you have to see. 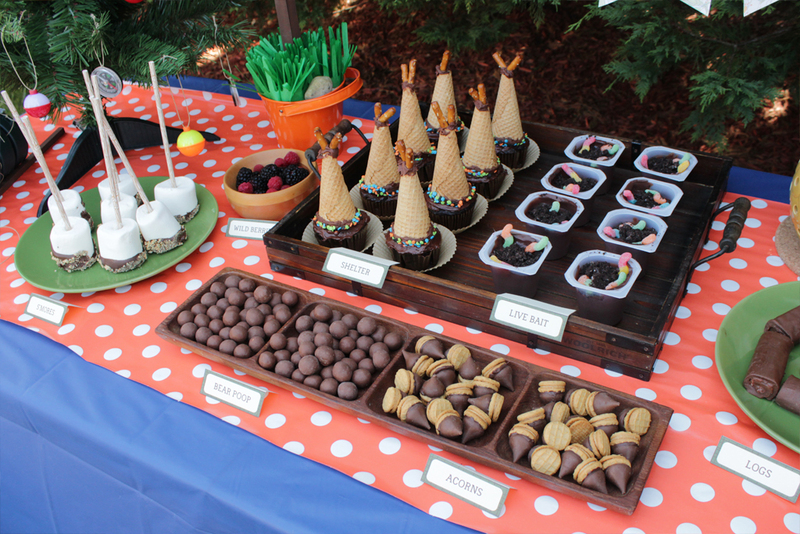 Rebecca Cofiño of Mamaguru blew it out of the watering hole with zoo-themed party for her son. She drew inspiration from zoo animal feeding habits for the party menu and wanted to keep it healthy. She labeled each dish with an animal postcard and cool fact about that animal’s feeding habits. The menu included peanuts, veggies and hummus, watermelon slices and peanut butter and banana sandwiches. The highlight of the table was the “watering hole” with her mango, guava and pineapple juice tropical punch mixed with lemon-lime sparkling water. The “PLEASE FEED THE ANIMALS” sign above the food table was too cute and an makes for an easy DIY project. She included instructions on her blog and shows you how to use scrap wood and a permanent marker to get the same effect. 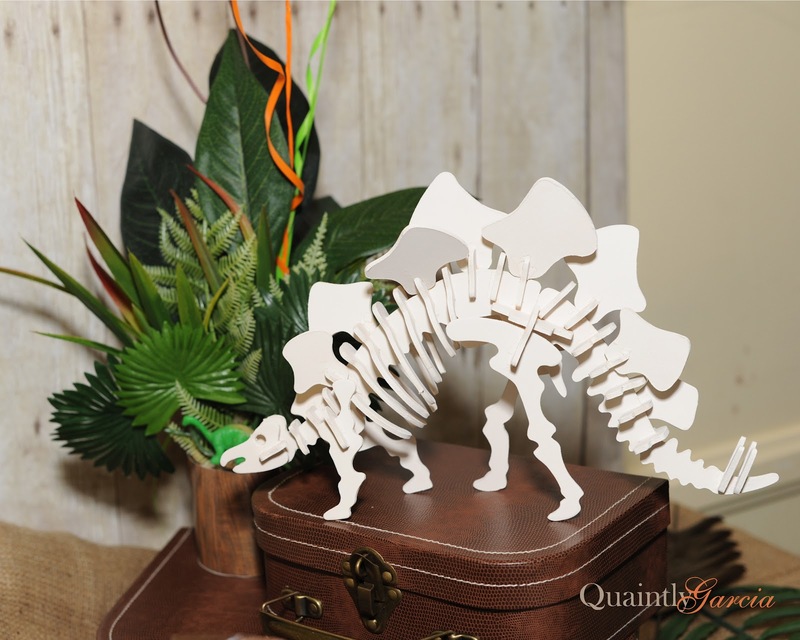 Decorating for your zoo party can be overwhelming but there are endless possibilities. Rebecca used animal-print balloons around the table and throughout the party space. 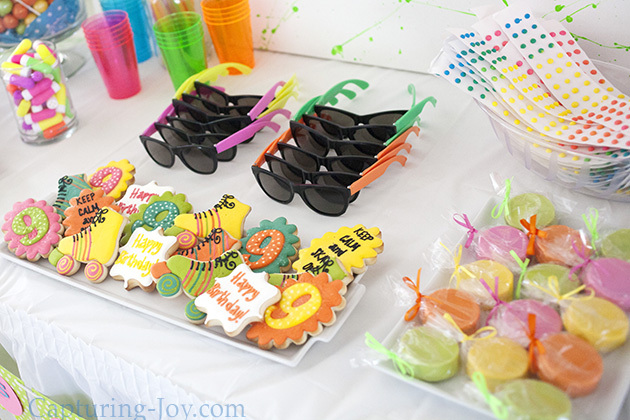 Her son’s friends took home animal cups, cool shades that they can rock on their way back to school and a box of animal crackers (this is a necessity and easy party favor). With endless roars, this party was a hit for Rebecca and could be for you as well! Summer is ending but for the school-aged kids a new chapter is beginning. Mariah from Giggles Galore threw a back to school party for her little bookworm who was starting kindergarten. Every party requires some cute invitations and Dimpleprints created the perfect invitation to invite her daughter’s friends to celebrate the new school year. This bookworm-themed back to school bash had some vintage charm with the old desk, bookshelves, globe and vintage books. LIVandLACE sells vintage books on Etsy in a variety of colors and bundles to fit your budget. The desk served as the food and snack table with traditional “school lunch” items that were simple and easy to make. Mariah served PB&J sandwiches, applesauce, fruit cups, milk and cookies. There were also some apple cake pops and apple-topped cupcakes that the kids couldn’t wait to lay their hands on. Dimpleprints also provided back to school bookplate printables for this party that the kiddos used to label their books with their names. Mariah also had her friend and photographer Elayne Dunn Photography capture moments of the day as well as a first day keepsake for each child to take home. 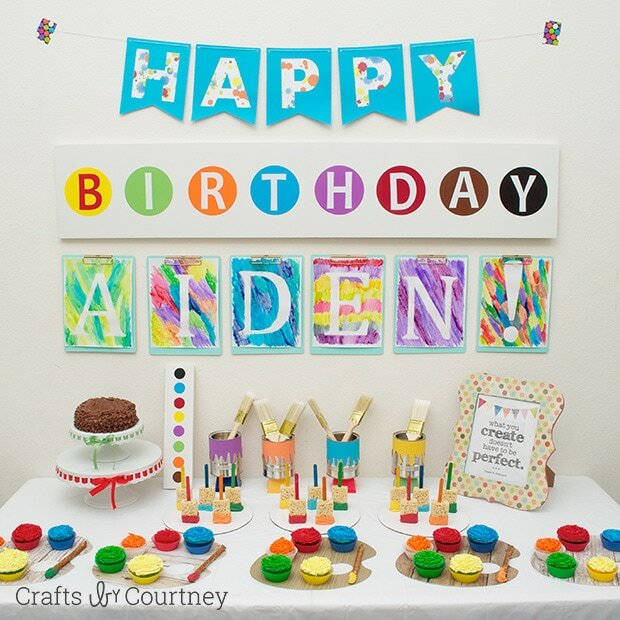 Etsy offers first-day-of-school signs that you can personalize for your child’s party. The goody bags were basic brown lunch bags filled with school supplies and a sweet treat. Consider doing a craft where the kids can create their own bookmark to take home. This is a great DIY for a bookworm-themed back to school party. Feeling all the emotions (or should we say emoticons) for this theme—literally. This emoji-themed back to school party will have your kids giggling the whole time. There are so many cool ideas for this theme, but our favorite was from Andressa Hara of Twinkle Twinkle Little Party. Andressa chose to incorporate turquoise blue into her emoji party instead of sticking to the standard yellow and black. The tablescape for this back to school party were fun and quirky. She used a lightbox to write “OMG it’s my birthday” but you can change this to “BACK TO SCHOOL” or a message of your choice. She hung blue-and-yellow garland and paper lanterns over the table and snack table. The emoji plates feature a birthday message but consider a more basic option for your emoji back to school party. Party City offers both blue and yellow kits to make decorating a breeze—and don’t forget the emoji balloons! The dessert table had tons of fun goodies from poop emoji cupcakes and cookie kabobs to a beautifully iced yellow buttercream cake. Black Twine, who sponsored Andressa for this post, offers a step-by-step poop emoji cupcake guide. The tassel garland that hung from the table added a fun touch. She sent guests home with blue gable boxes with a variety of emoji party favors and fun shutter glasses. 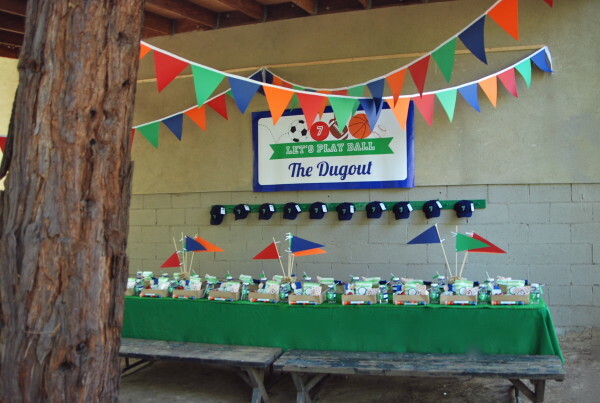 Jenny of Bloom Designs hit the ball out of the park with this sports-themed party for her son’s 7th birthday. She went bold and bright for this party with her son choosing the color scheme of red, navy, green and orange. 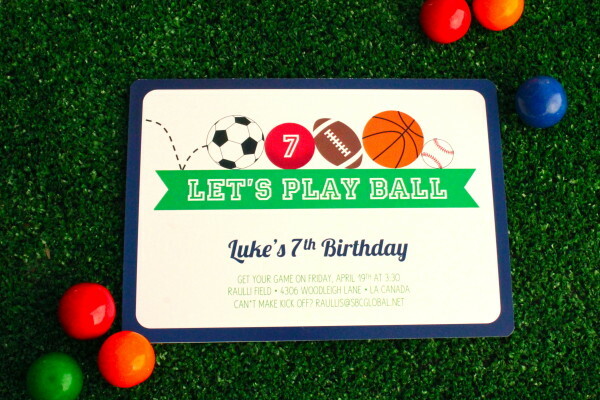 The simple invitations read “Let’s Play Ball” and encompassed the sports theme with graphics of the balls and the color scheme that Luke selected. 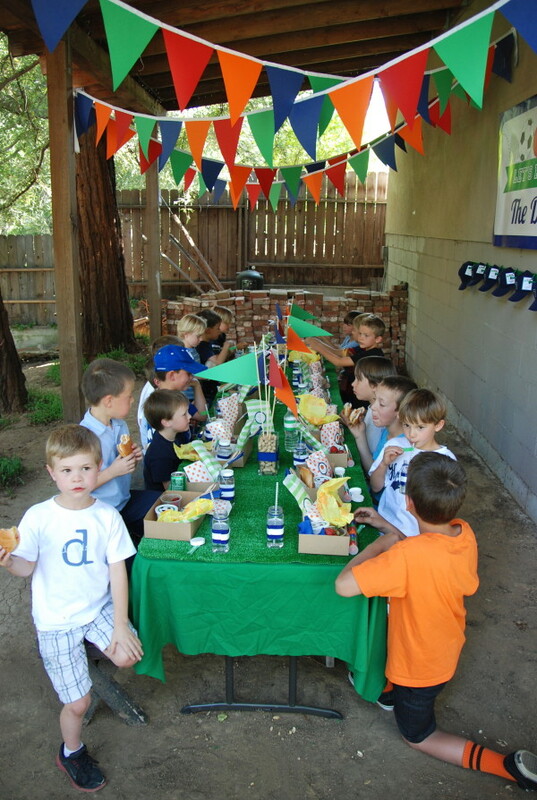 Her son’s friends ate lunch in “The Dugout” complete with a banner that Jenny had custom made for the party. The porch was covered with pennant flags in orange, navy, green and red. The picnic table had a green tablecloth and fake grass that served as a table runner. She ordered custom baseball caps for party favors that were embroidered with a “7” to represent her son’s party year. For your back to school party, consider doing your child’s grade or their graduation year (if you even want to think about that…cue the tears). You can check out local embroidery shops in your area to order caps in bulk. Custom Ink also offers custom shirts and baseball caps. Our favorite part of the party was the snack table—no surprise here. 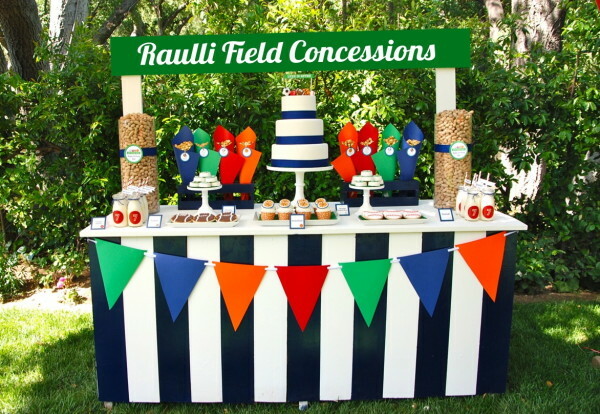 The Raulli Field Concessions featured all the sweets with different cupcakes, cookies, cracker jacks and vanilla shakes. Jenny incorporated all the sports into this party. The refreshment stand offered beverages for the minor league (kids) and choices for the adults (major league). Jenny, you definitely scored a touchdown. This back to school party will bring out the sporty side of us all. 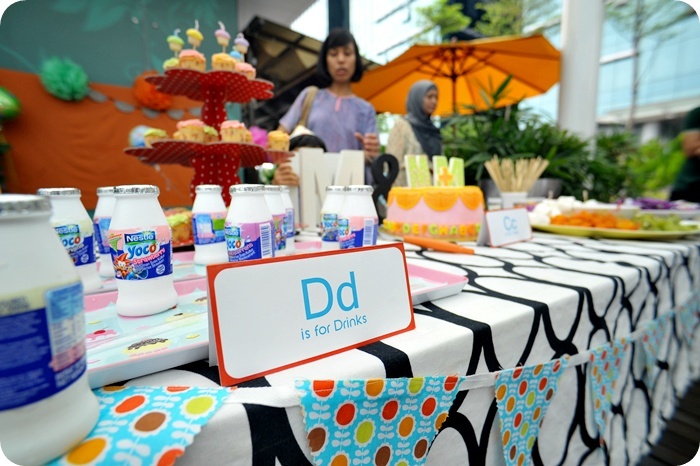 Ira of IDoubleRa went complete DIY for her kiddos alphabet-themed party. Even though this was for the dual birthday, we thought it would also be fitting for a back to school party. The color palette was very neutral with orange, pastel green and pink as the main colors. She hung a pennant flag garland with personalized names. We found a similar pastel alphabet garland and a primary color alphabet garland that were both too cute and could work for your own ABC’s back to school party. She hung handmade tissue paper pom-poms from the ceiling. You can also purchase pom poms depending on how crafty you’re feeling. 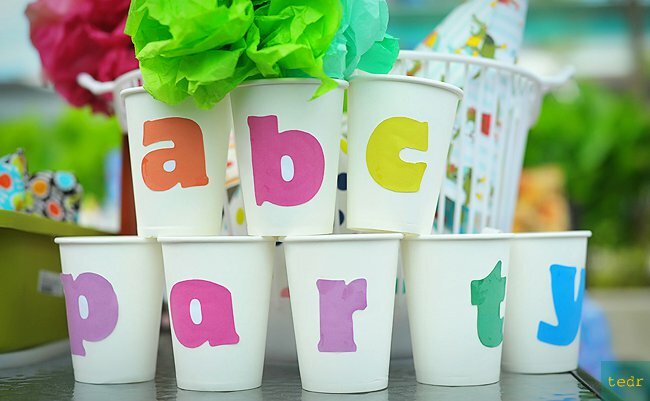 The last major must-have for this alphabet party was DIY alphabet paper cups with letters. Ira collaborated with Violet of ProjectKid with an easy tutorial. The kiddos had a blast posing for the photo booth. A DIY photo booth is easy to make by hanging a tablecloth on the wall and decorating with pom-poms and garland. Etsy has a ton of props that you can choose from for your photo booth. This alphabet party looked like a hit and a great start to the school year. If you’ve got a kid that loves everything about counting, numbers, math and whatever else—this is the party for you. Hayley of Mouse House Creations threw her son the mathiest number party we have ever seen. She had exactly 24 hours to pull it off and we give her mad props for her craftiness. Decorations, balloons, water bottle labels and much more—this house was taken over by numbers. She die-cut numbers and tied a string to them to hang from the ceiling on chandeliers, hooks and the fireplace mantle. 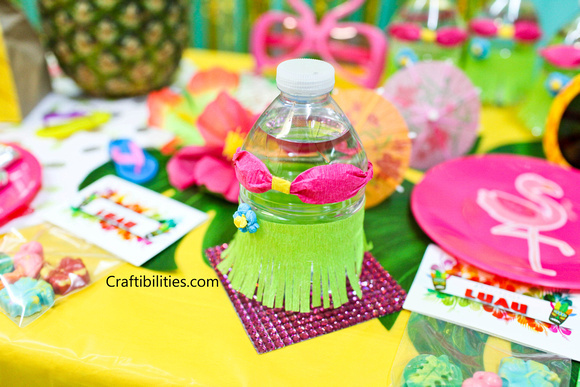 The garland, water bottle labels and other printables came from Piggy Bank Parties. Hayley used a clear vase and inserted foam numbers inside to serve as a centerpiece. Consider adding some florals to brighten up your table. She found some balloons and a large “5” balloon since it was her son’s 5th birthday. For your back to school party, you could implement your child’s grade by finding a balloon with that number. This party was easy as 1-2-3 and Hayley’s son LOVED IT. If your student is a numbers whiz with this math back to school party may be just the right angle for your celebration. Get ready Moms—this one’s gonna be messy! Let’s face it; kids are über creative and their imaginations are always coming up with the coolest things. So why not throw an art party to celebrate going back to school? 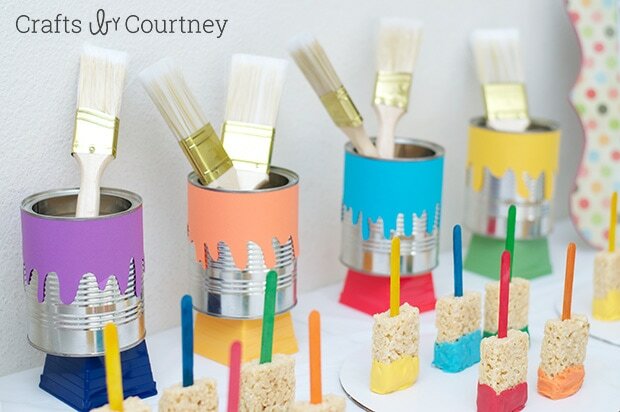 When looking for art party inspiration, we found Courtney’s blog, Crafts by Courtney, which was chock-full of cool crafts and DIY décor. 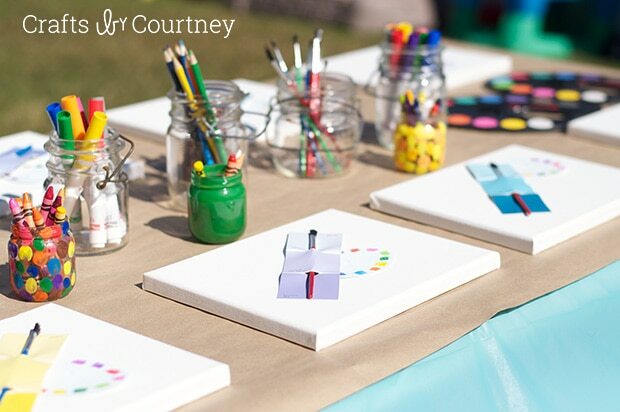 Courtney threw an art party for her son and it was ADORABLE. Her display table was eye-catching with its bright colors and watercolor theme. She used her Silhouette machine for the pennant banner to create a wall-sized watercolor palette design to spell out “B-I-R-T-H-D-A-Y” and completed the look with watercolor art in her son’s name. You could easily modify this concept to spell out “BACK TO SCHOOL” or a teacher’s name, school name, grade, etc. Her intricate desserts were an art form in and of themselves. 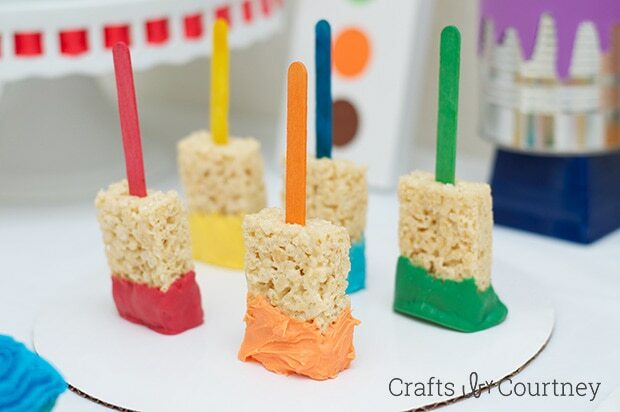 She made yummy paint brushes by dipping Rice Krispie treats in colored chocolate and inserting popsicle sticks. To recreate the look of paint cans, she recycled baby formula cans, added cut scrapbook paper and hot glued it directly on the can. To recreate this design, you could use any large can or cylindrical container. The cupcakes sat on custom-cut scrapbook paper to look like artist palettes. No art party would be complete without a craft. Courtney gave the kids recycled cans which they covered with paper to create custom pencil holders. They also got to paint with watercolors on canvas while donning their own crafting aprons that doubled as party favors. Messy clothes and lots of giggles later—this art party was a masterpiece. If you have a little artist in your house, try throwing your own art-themed back to school party to kick off the school year. This back to school party is out of this world—literally. Gwynn, of Gwynn Wasson Designs, threw the coolest outer space party to mark her son’s milestones before he blasted off into the new school year. Jugs of milk rocket ships completed the look. She added custom-printed “rocket fuel” labels to cover the juice boxes to give them a little more pizzazz. She also created cereal box jet packs for the kids to “fly around in” using the leftover boxes. She also created some is also super awesome back to school blast party printables to make planning your outer space back to school party a breeze. Gwynn hopes your little one has a BLAST this school year. We’re heading out to nature for this one with all these incredible ideas from Kristin of Yellow Bliss Road. For months her son was “bugging” her to throw a bug-themed party for his 4th birthday, and we thought that it turned out so neat that it would be perfect inspiration for your own nature and insect-themed back to school party. Kristin purchased artificial grass and a roll of burlap from her local hardware store to serve as the table coverings for both the guest and food tables. She had potted mum plants and a variety of plastic bugs and snakes scattered on the tables. She hung balloons from the plants to double as centerpieces. She also hired Steve the Nature Guy as entertainment. He brought loads of animals and little creatures with him. The kids had a blast! There are loads of similar animal entertainment businesses that offer these services, and you can likely find an exotic animal or reptile experience near you. 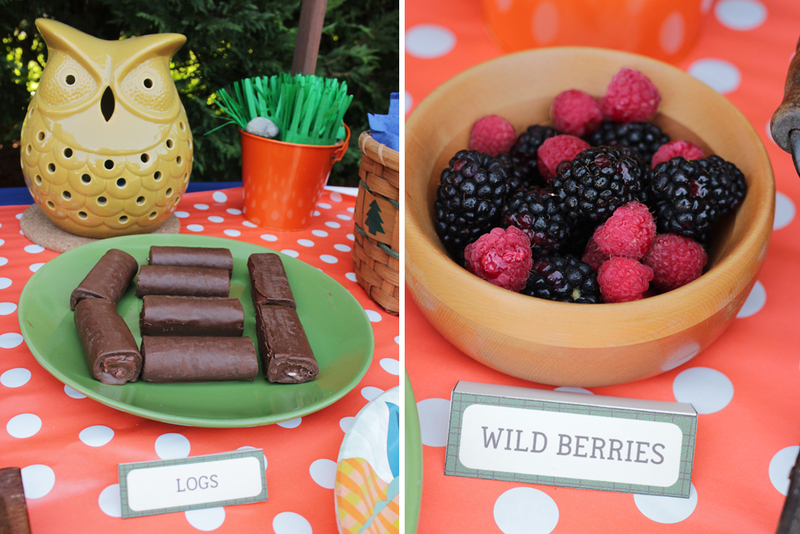 Many additional details about this insect-themed party are featured on her blog. The kids took home goody bags with bug catchers and insect flashcards. You could also share the plastic insects you used on the tables as an additional take-home item. 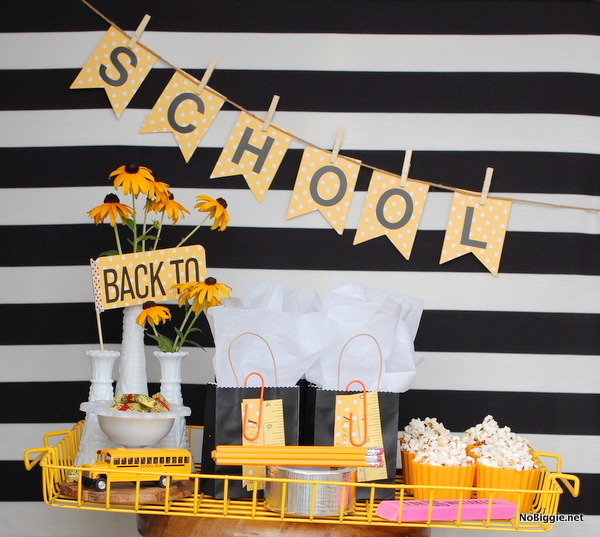 This party had all the little bees buzzing with excitement, and with a few simple modifications it could be a great way to kick off the school year! Got a mad scientist on your hands? Consider planning a science-themed back to school party that will be unforgettable. From the periodic table of elements to the radioactive pizza and DIY slime, your kid will be ready to crush science class this year. She used paper lanterns to create a molecule model and to bring more dimension to the table. This is a crafty project so be prepared to break out the hot glue gun. Michelle covered her food and dessert table with basic tablecloths in orange and turquoise. The periodic table garland was a nice touch and seems too cute to pass up. The science lab centerpiece is an easy DIY project using beakers, water, food coloring and sprinkles. Like most parties, it wouldn’t be complete without some snacks. ‘Michelle highlighted her party theme by serving radioactive pizza, atomic apples and petri dish jello. She partnered with PBS Parents for this party and you can find all her science party kid’s recipes on her page. Kids love slime and it also keeps them entertained for hours—a perfect addition to this science party. There are plenty of slime ideas available online to coordinate with nearly any party theme, color scheme or design. So grab your lab coats and goggles for this mad scientist back to school party . 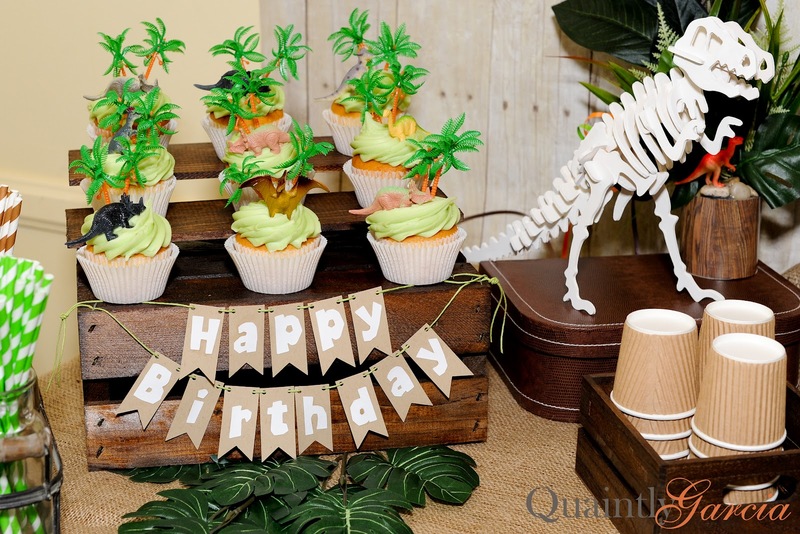 We have even more scientific birthday party ideas for children on our other blog. This back to school party is sure to make waves with any crowd. Rebekah from Somewhere in the Middle put together the most darling sea-themed party. She handcrafted the cutest desserts and décor, making this a DIY dream that won’t break the bank. The backdrop to her dessert table features a scaly wall made from varieties of paper. Rebekah was going for more of a mermaid vibe for her daughter, but feel free to switch up the color palette if you’re doing a party for boys and girls, or simply want a different look. Green streamers were taped along the wall to resemble seaweed. Streamers offer flexibility in the party decorating realm; if you’re looking for additional ideas, consider hanging streamers in a variety of blues and sizes from the ceiling to create a more oceanic feel. She hung jellyfish from the ceiling that her daughter loved so much that she had them hung in her room after the party. She matched the tablecloth to one of the colors in the scales and placed a fishnet tablecloth over the blue one to tie into the sea-themed party vibe. For dessert, Rebekah made octopus cupcakes using campfire marshmallows and creativity with some icing, blue jello with drink umbrella and a blue Ombre cake. She cut out turtles and crabs and glued them to paper plates which is way more exciting than plain ones. 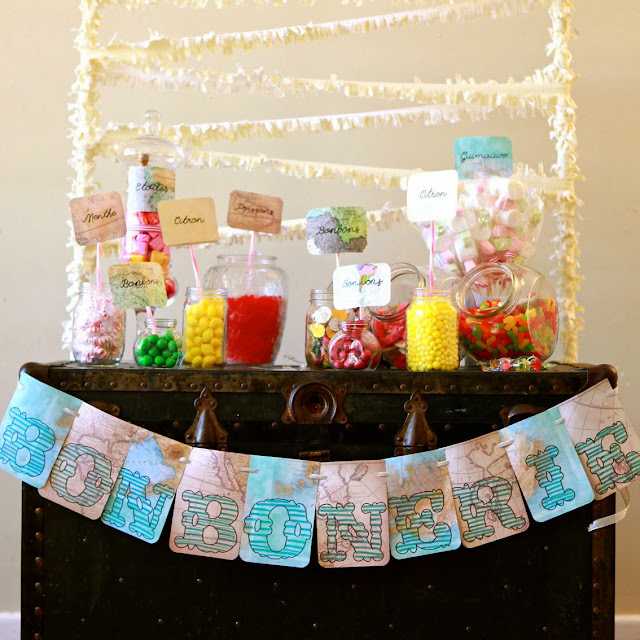 This party was super cute and offered a treasure chest full of great ideas that you can recreate with ease for your back to school party, making this school year’s start a splash! I scream, you scream…we all scream for ICE CREAM! With the hot temps of summer, there’s nothing better than a cool treat like a yummy ice cream cone. Cool off from summer vacay and celebrate going back to school with an ice cream social for your kiddo. Laura from Laura’s Little Party had us head over heels for her simple yet extravagant ice cream social. She used a bright pink bar cart that she found from HomeGoods. Since locations vary and bar carts can be a little spendy, if you’re budget-conscious you can also check out thrift stores or local resale shops to score a bar cart and spray paint it in a bright color of your choice. Laura set out bowls, cups and cones for her guests to pile on the scoops. She suggested getting cake stands to make the cart less cluttered and to act as a decor focal point. Her cart was fully decorated with a tassel garland and ice cream garland that she scored from Target’s dollar deals. 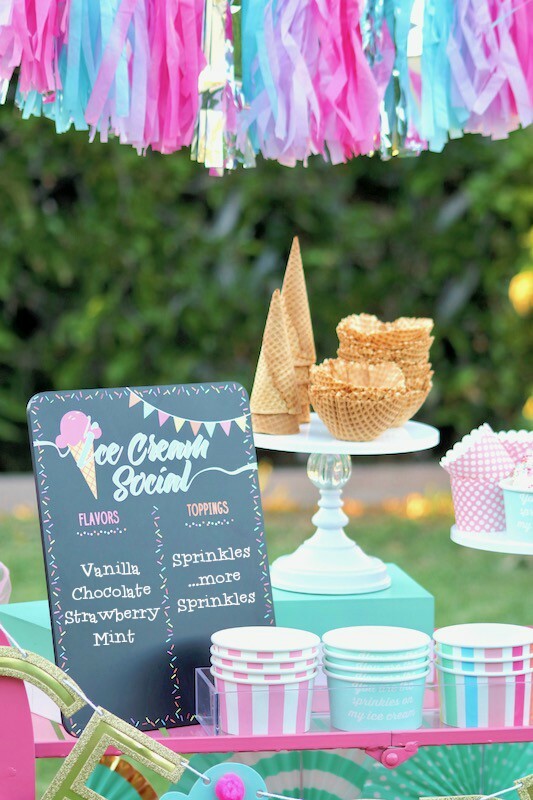 Etsy also offers a ton of ice cream social decorations that are cute and budget friendly. This ice cream social was a perfect way to celebrate going back to school with friends, family and classmates. Dinosaurs may be extinct but this B.C. back to school party will be one for the books. 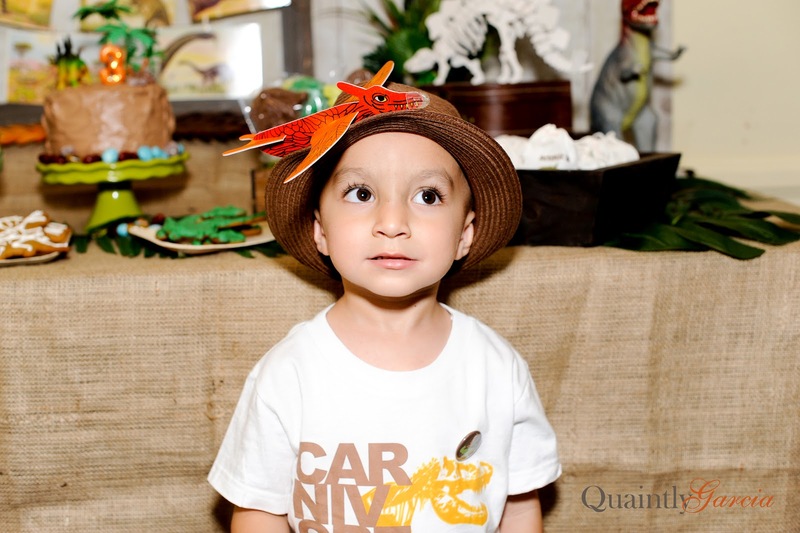 Adriana of Quaintly Garcia threw a dino-rific party for her son and his friends. She gives all the credit for his love of dinosaurs to the Natural History Museum of Los Angeles since they have been regular visitors since he was a baby. The museum offers a birthday program for the guests, so Adriana didn’t even think twice about the location. When her son arrived at the party his expression was priceless! 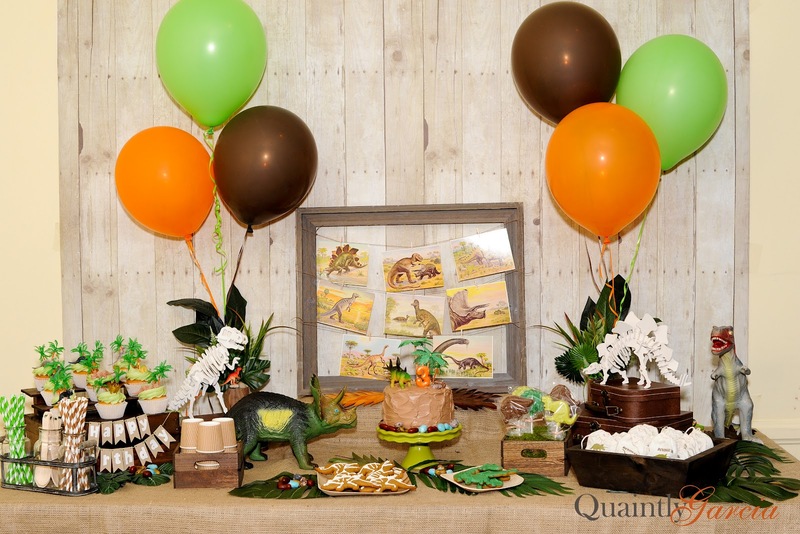 Adrianna’s tablescape for this party took us back to the Jurassic period with its rustic wood tones and burlap tablecloth. The balloons complemented the brown, orange and green color scheme. She found antique suitcases to use as dinosaur skeleton stands and used an old frame, twine and clothespins to create a photo display. She strung a “Happy Birthday” banner across a wooden crate cupcake stand. Changing the banner to “Back to School” is an easy substitution for your party design. Adriana baked lots of sweets for this dino-themed party including cupcakes, dinosaur-shaped cookies and a cake. The festivities included games like “Pin the horn on the Triceratops” and “Tyrannosaurus Says.” The kids also made their own dinosaur masks and fossils to take home. Since this party was at the museum, it included admission as well as special guests to talk about fossils. This party came together with the help of Adriana’s family, friends and the incredible staff of the Natural History Museum of Los Angeles. This back to school bash is perfect for any T-Rex-loving student. 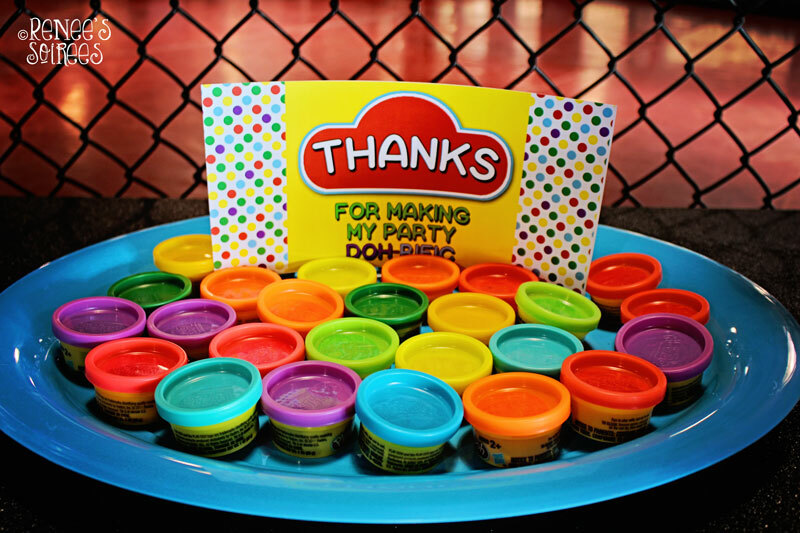 Renee, creator of Renee’s Soirees and brains behind this Play-Doh-themed party, turned a martial arts gym into a Play-Doh factory. She owns a party styling business that focuses on printables for purchase in her Etsy shop. 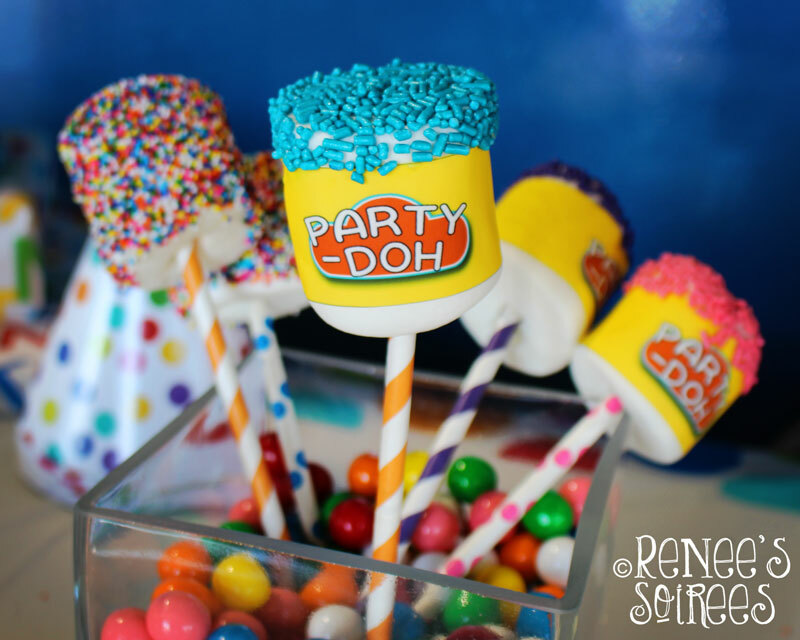 Renee created the Play-Doh-themed printables for this party that included invitations, marshmallow wrappers, cupcake toppers, water bottle labels and much more. The color schemes for this party focused around the colors of the Play-Doh logo: yellow, red and white. 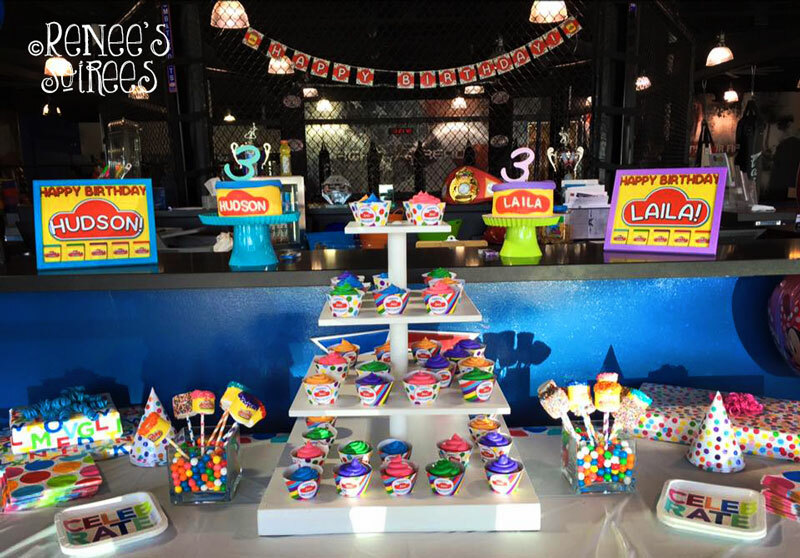 The banner hung above the dessert table is from Renee’s Play-Doh printable collection and can be customized for your back to school party. The hosts were crafty and transformed jumbo marshmallows into Play-Doh tubs. Renee made a printable suitable for any baker to print on edible paper with edible ink. Then they dipped the marshmallow top into sprinkles to resemble the lid. 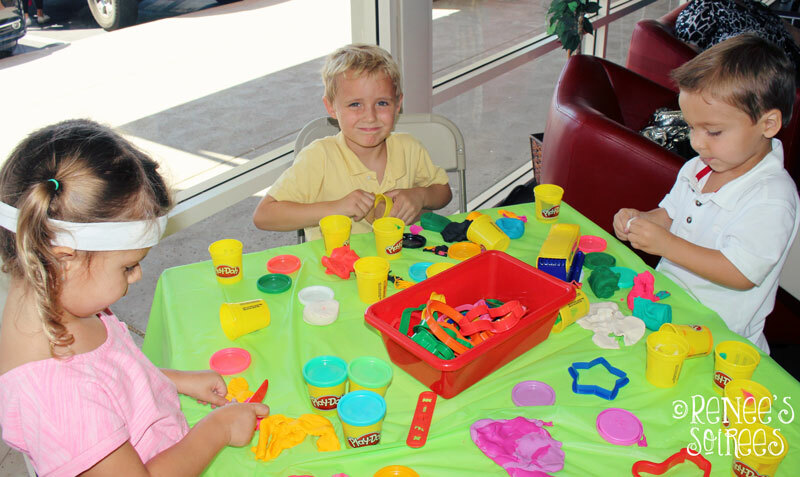 The kiddos had a Play-Doh station with a brightly colored tablecloth. You could let their imaginations run wild or build school-themed masterpieces such as pencils and books. Favors included party-sized containers to take home with personalized stickers for the lid from the collection. This back to school party is easy-peasy, and with the help of Renee’s awesome printables it makes decorating a breeze. Succulents are all the rage, so why not throw a whole back to school party around themed around cacti? We guarantee it won’t succ with this festive party design. Carolina from Mint Event Design was inspired by pastels, greens and everything about Cinco de Mayo for her Cactus-themed celebration. The main decoration for this party was a Saguaro cactus made completely out of balloons by Nate the Great. Alongside the balloon sculpture were “papel picado” garlands in green and pink by J. Balloon Fiesta. Her dessert table was covered in a dark green tablecloth that contrasted nicely against the lighter pastel tones. Carolina laid a colorful table runner over the table to tie in with the lively theme. The site she used, Ship Party Return, also includes other cactus décor as well as plates that you could include in your back to school party. For refreshment, she served pink lemonade in a barrel-shaped drink dispenser. When choosing your drink, consider one that ties into your color scheme; this pink lemonade matched the various pinks in the décor. Carolina is a lover of mason jars…but who isn’t? She asked J. Balloon Fiesta to design “papel picado” drink wrappers and Saguaro shapes for the straws. As for dessert, J. Balloon Fiesta created a mini cactus piñata for the cake topper and Carolina went into full DIY mode for these adorable cactus cupcake toppers. Carolina didn’t disappoint with her adorable cactus-themed fiesta. 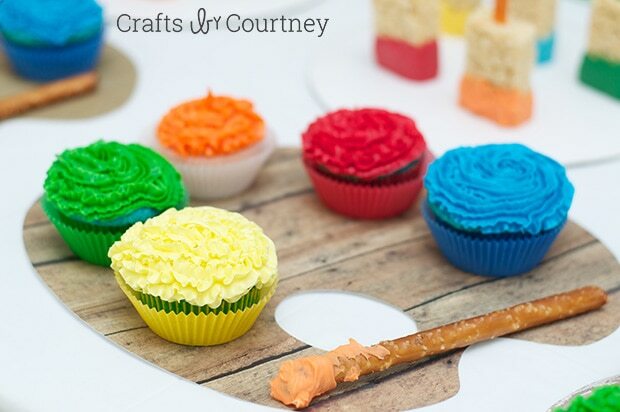 Celebrate until mañana with this fun-filled back to school party idea. Pizza is a student’s food staple from pre-k to college – it’s yummy and so hard to pass up. Pizza, friends and family are the perfect way to celebrate going back to school. Brittany of GreyGrey Designs transformed her home into an Italian pizzeria for her son’s party. This tablescape reminded us of a restaurant with the gingham tablecloth. She hung green, white and red festooning behind the table in the design of Italy’s flag. Brittany said that it was such an easy DIY! To set the table, she used wooden boxes and risers, and simple metal containers turned on their tops as builds for her desserts. She even added some cute squares of gingham. The galvanized metal boxes had a chalkboard stripe so that she customize them for the rice krispie treat pizza slices and kabobs. The pizza banner was another easy DIY using felt, scissors, hot glue, ribbon and lots of patience. Every year Brittany displays her son’s initial and decorates it to fit in with the theme. This year the ‘G’ looked like a pizza slice using the leftover felt. If you would like to incorporate something similar, consider your child’s initial, grade, school name, etc. Pizza plates, pizza napkins and many slices of pizza later (with some gummy pizzas for later) this party was a success! Fill up their tummies before their first day with this pizza-themed back to school party. Grab your hiking boots and camping gear because this back to school party is going to be…in-tents. 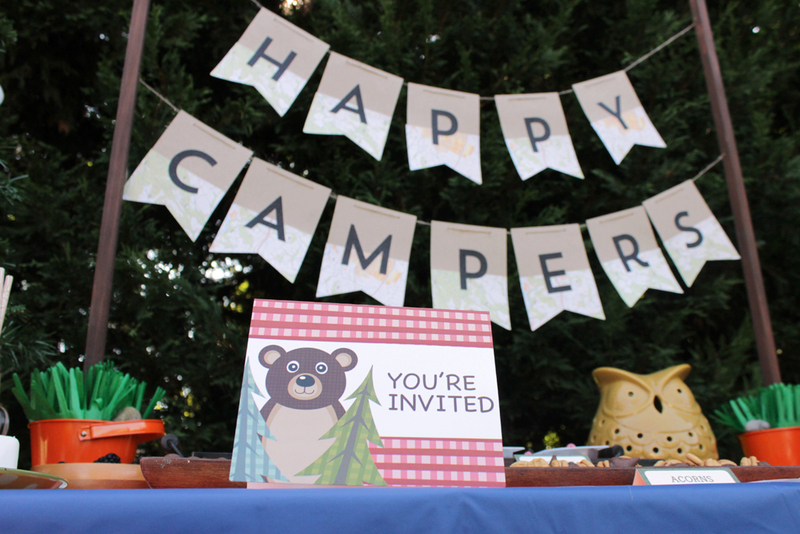 Tara from Spot of Tea Designs showed us how to throw a camping-themed party that will take you right back to the camp without leaving the backyard. 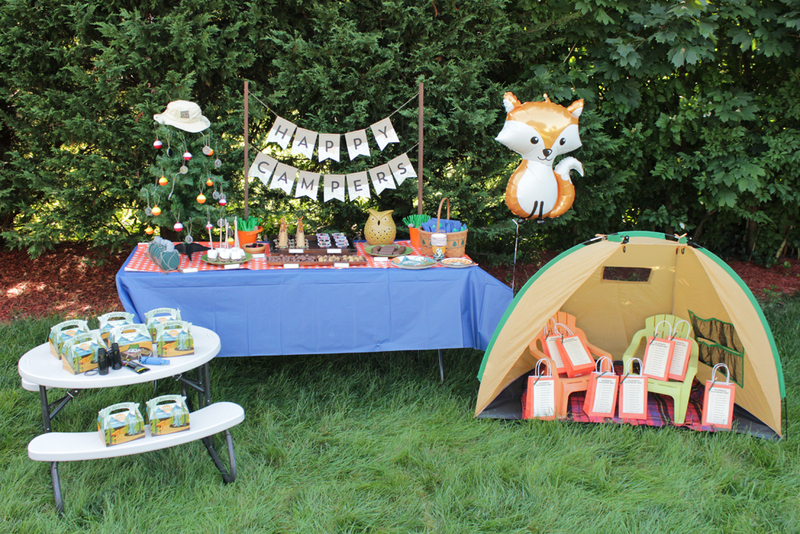 She partnered with Wholesale Party Supplies where she purchased everything you need for a camping-themed celebration. This party is perfect before heading back to school and a great time to enjoy the warm temps before the hectic school days begin. Start off by sending your guests a camping-themed invitation to let them know about the big day. Camping is all about heading outside and exploring so make sure the party décor reflects that. Tara set up her table right in her backyard using the foliage as the backdrop. The color scheme for the party was very natural using greens, browns and blues; the plates even kept up with the theme. A DIY “Happy Campers” map banner hung by the table. There are tons of options that you could use to personalize this to fit your color scheme and style. We found a cute plaid version on Etsy that would tie in perfectly. For those budget-conscious parents, browse around your house for decorations for the party before heading to the store—think plaid blankets, rustic wood and burlap. 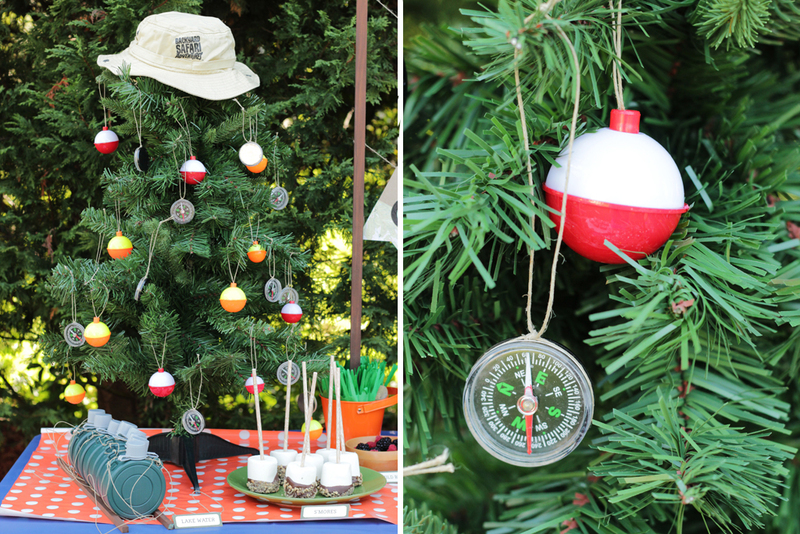 Break out the Christmas tree to bring more dimension and liven it up with fishing bobbers and compasses for ornaments. 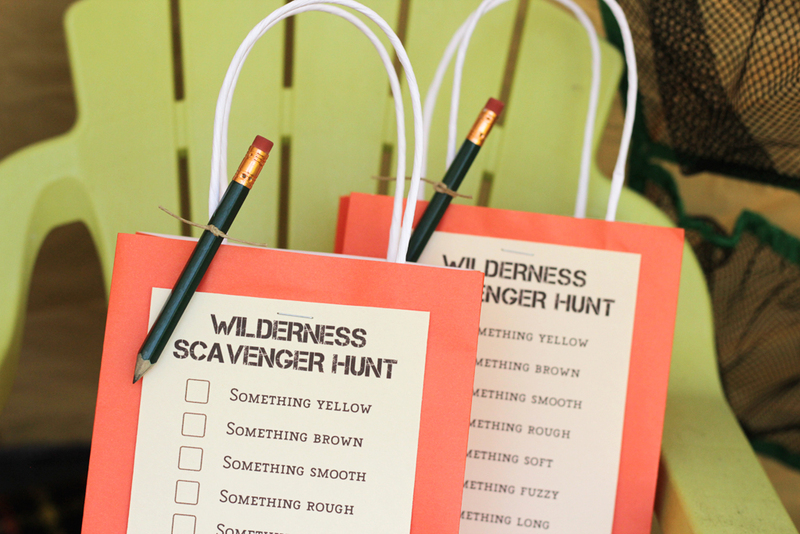 From a scavenger hunt to making s’mores, the possibilities are endless for a camping-themed back to school party. Getting outdoors is always a good idea so grab your binoculars and take a hike before the school year begins. Say aloha to the new year with a back to school luau. 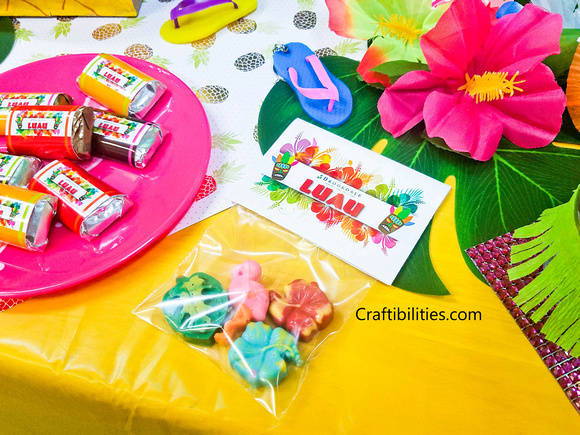 Elena, the crafting mama behind Craftibilities, hosted a Hawaiian- themed Bingo night at the local retirement residence—how sweet! 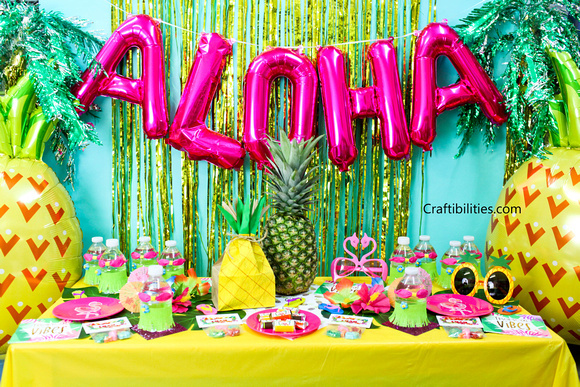 The focal point of the room was the dessert table with the large magenta “ALOHA” balloon garland. She hung a teal tablecloth as the backdrop with a gold foil curtain that Elena found leftover from her New Year’s Eve party. Elena went into full crafting mode to create her adorable treats. She made chocolate-dipped Oreos and adorable flamingo, leaf and flower-shaped chocolate melts. 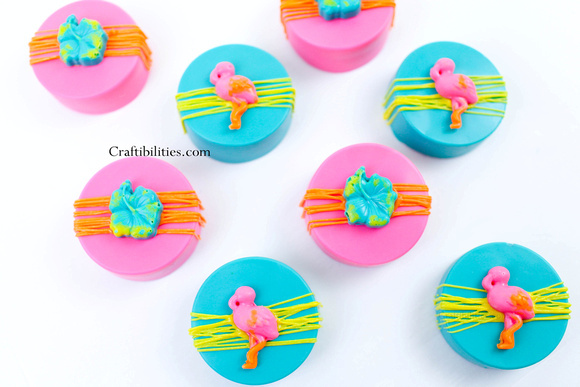 She also decorated luau-themed cupcakes with pink icing, sprinkles and flamingo toppers. The residents loved the hula skirt and bikini top water bottles that Elena made using paper streamers. She made note that the streamers didn’t hold up against the condensation but suggested trying plastic tablecloths. She covered the tables with yellow tablecloths and added a large flamingo or pineapple balloon to each table. Consider adding balloons around the room to brighten up the space—plus who doesn’t love balloons? Leaves and flowers were scattered around the tables to bring the luau to life. She DIYed the centerpieces by making pineapples favor bags filled with keychains and treats. After dessert, they moved the table and turned the aloha backdrop into a photo booth; consider adding luau-themed photo props to add to the fun! Tropic like it’s hot for this back to school party—don’t forget hula skirts and leis for your party guests. Creating a joint boy-girl royalty-themed party can be challenging—do you make it more about princesses with sparkle and glam or more medieval with knights and shiny armor? Iris from Sweet Metel Moments combined the glitz with iron for her two little ones with her knight and princess party. The theme began as a University of Central Florida-themed party with the black and gold color scheme; Iris creatively combined their Knight mascot with her daughter’s love of princesses to create a unified look. To stay within budget, she created the majority of the party decorations. Our favorite piece (and Iris’) is the DIY frame that displayed pictures of her kids dressed in princess and knight attire. She incorporated the gold, black and white color scheme. Iris also created her own printables for the party including invitations and the birthday garland. She created labels with the kiddos names on them for the 2-liter sodas, water bottles and chips. The dessert table was very simple with a white tablecloth and DIY curtain backdrop. The beautiful cake was accompanied by other desserts including Oreo Cakesters that Iris dressed up by adding gold sparkly sugar, Oreos covered in white fudge, white chocolate castle pops that she made using candy melts and a lollipop castle mold and lots of gold chocolates – Talk about a sugar rush! Since this was a joint party, she created separate tables for the princesses and the knights. She marked them with printables: “Reserved for Knights” and “Reserved for Princesses”. For the princesses, the table was covered with a simple girly tablecloth that Iris made, gold glittery wands and princess crowns to take home. The knights’ table was basic with swords and shields that the boys could play with. This royal-themed party was full of laughs and smiles all-around. 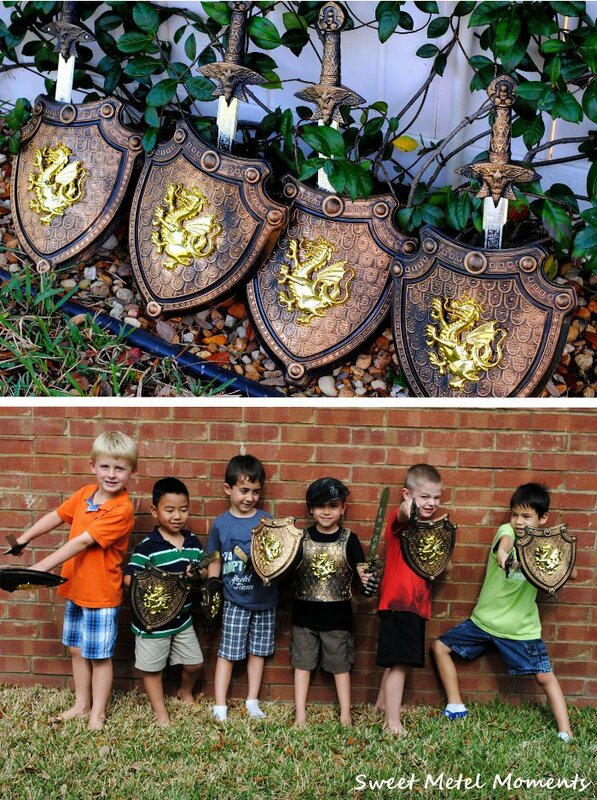 It’s perfect for a back to school party for your little knights and princesses. Break out your favorite board games for this back to school party that’s perfect for all ages. Censie from Building our Story was inspired to throw a game night for her family and friends after venturing through her game collection. Playing board games together as a family is a pastime for many, so why not throw a back to school party that everyone can enjoy? All eyes were on the tablescape she created using a Twister mat as the tablecloth and backdrop. The playing card garland was an easy DIY with twine, hole punch and cards. The choices for the games were based on her family’s favorites: Candy Land, Scrabble, Monopoly and dominoes. The cupcakes were straight out of Candy Land with lollipop toppers. Censie suggested creating food stands out of the games you plan on playing and to still allow people to play with those games you can simply take out the game boards and pieces and set out on another table. 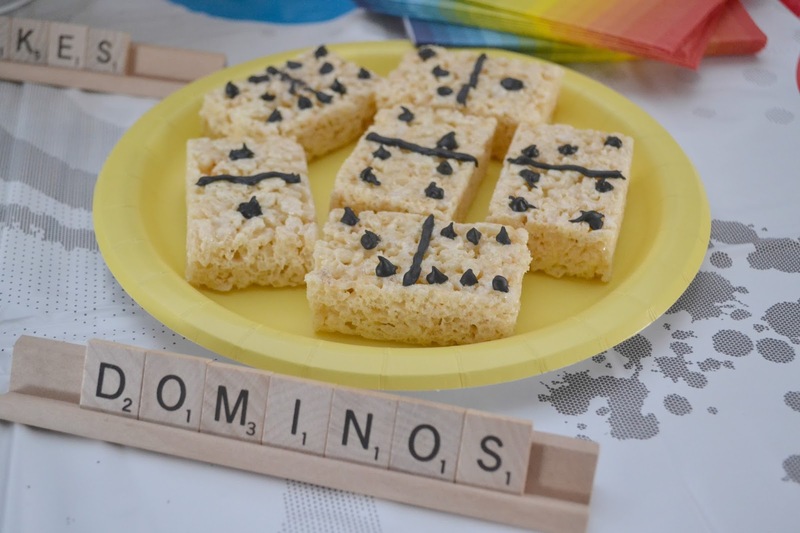 She used Scrabble tiles to spell out each food—so easy and creative! 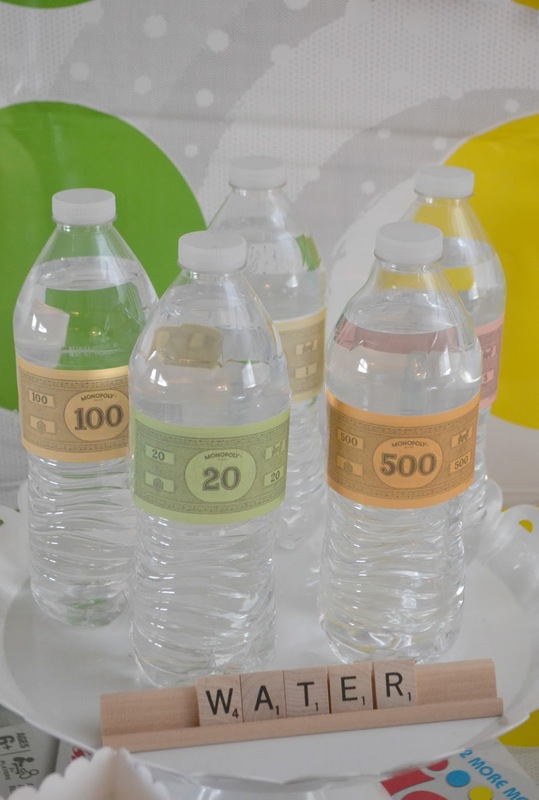 Another fun detail was the water bottle labels made out of Monopoly money. The bottles added a splash of color and Censie said guests smiled at the thought of grabbing the most expensive bottle. This party was fun and a perfect way to celebrate going back to school with family and friends. Drive-In movies are reminiscent of summer days and really bring a new meaning to seeing it on the big screen. There are fewer and fewer drive-ins that are operational these days, so why not bring the fun to your house for this back to school party? Solagratia Mom inspired us with her creative take on a backyard movie party by making it drive-in style. She sent out invitations to her daughter’s party guests as well as the instructions on how to build their own drive-in car for the main event. The kids had a blast personalizing their cars with their favorite colors, stickers and license plates. For the night of the party, she placed Tiki torches in the yard that resembled the parking poles at the drive-in (just like those that allowed for speakers to be attached to cars). The decorations were very basic for this party including a concessions sign, popcorn tablecloth and striped popcorn containers for the kids to snack on during the movie. Before dark there was an awards ceremony for the DIY cars. The parents passed out certificates for various categories including “best use of duct tape,” “brightest,” etc. When the kids received their awards, they walked the red carpet and put their handprint on their own Hollywood Star. The movie was shown on a projector screen in the backyard with the kids nestled in their vehicles. Solagratia Mom put a creative twist on this party and it turned out great. Your kids will be ready to hit the road and go back to school after this party. You better watch your back for this one. We’re hopping on a plane and heading to Asia with this ninja-themed party. Maureen from Anders Ruff transformed her home into an Asian palace with traditional elements for a ninja-themed birthday party for her son. With a few modifications, you can easily transform this into a back to school party for your little ninja. She decorated her entryway and space throughout the home using red, white and yellow paper lanterns as well as Chinese screens for backdrops. The screens could also be used to break up the space for different activities. Maureen laid a bamboo table runner across the table. She created centerpieces by placing Lucky Bamboo shoots in vases with rocks; this detail adds a natural element against the warm color scheme. The kids sat around the table on pillow seats to mimic the culture. Each place setting had a black plate, small red plate and a Chinese take-out box with lunch inside. Maureen served rice cakes, veggie sticks and fruit cups. The kids each had their own set of chopsticks to try eating their food. The water bottles were decorated with a printable that she created. For the dessert table, she used a Chinese screen as the backdrop and carried the bamboo elements by displaying them in vases again. For the dessert displays she used bamboo organizing caddies to stick with the theme. 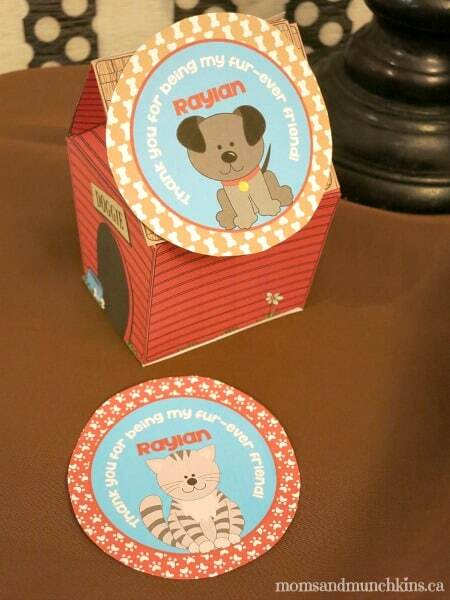 For favors, the kids went through the “candy take-out” line and filled their to-go boxes with candies of their choice. Maureen used a dragon poster as the backdrop for this area–way too cool! The table had a ninja star garland that her boys loved. This party had a ton of cool elements and this was only a preview of all the awesome ideas that Maureen kicked in. If you have a little ninja running around your house, consider throwing a ninja-themed back to school party before heading into the new year. Adventure is out there! Show your kids the fun that awaits this school year with a Disney’s Up back to school party. This movie sparked the imagination of many young minds as well as Melissa of Melissa Diep Photography for her son’s Up-inspired party. Balloons and smiles filled the room as they celebrated her son’s milestones and adventures that await in the upcoming year. Decorating for this party was pretty simple. Brightly colored tablecloths lined the tables with balloons scattered around the room. She created adventure-inspired décor using vintage globes and suitcases. 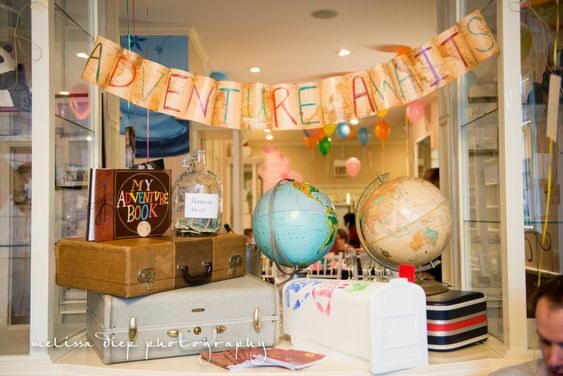 Melissa created the “ADVENTURE AWAITS” banner by cutting a vintage map, hole punching it for the string and writing the letters using a variety of markers. Each guest got to take home their own Adventure Book created by Melissa. This favor will be a keepsake for many and is such a cool way to keep track of all the memories for the upcoming school year. Guests lined up for the DIY photobooth using streamers and props; a great first memory for the adventure book! This back to school party wouldn’t be complete without a viewing party for the movie Up with popcorn and grape soda in hand. 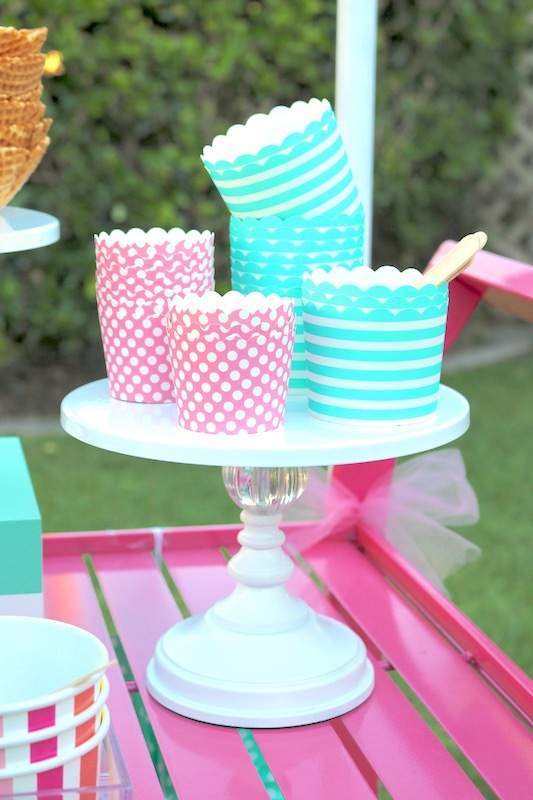 Melissa nailed it with this adorable Up-inspired party. Fun Fact: Snappening’s roots are in Indiana. Also known as the land of corn, cows, beans and more corn, so we’re hitting the dirt roads and heading for the country for this farm-themed back to school party. Bron from Maxabella Loves threw the darn cutest farm-themed bash for her son. Not only did she have us laughing as we read her blog, but she had a TON of helpful tips and tricks to throwing your own party. She transformed her backyard into a farm with picnic table settings, home cookin’ and tons of rustic décor. The guests showed up in cow attire or flannels (mostly flannels) but kudos to the creativity on the cow costumes! The kids played games including: build the scarecrow, horseshoe toss, gumboot toss and had their own scavenger hunt. Bron’s activity sign literally pointed the way to each party zone with its arrows. As for food, Bron fixed up a ton of options that were inspired by home cookin’ and it all looked so YUMMY. She even labeled each food and water bottle with these adorable printables. She hung a sign above the table that said “Dig in” with a gingham-patterned tablecloth. We give this party a “Yee-haw!” Your kids will be pooped and ready to hit the hay after this back to school party. This party is so BRIGHT with its neon color scheme, you’ll feel like you’re back in the 80’s and you gotta wear shades. 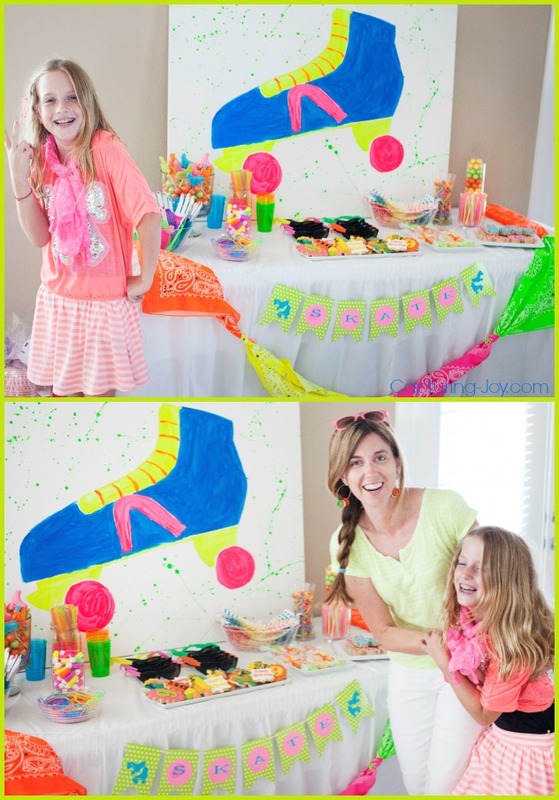 Kristen Duke from Kristen Duke Photography gave us the inside scoop on how her daughter’s neon skating party came to life. So..her daughter didn’t want to go roller skating, but they sure had a blast with all the bright colors, shades and fun desserts. She kept it simple with white tablecloth, colorful plates and colorful cutlery. 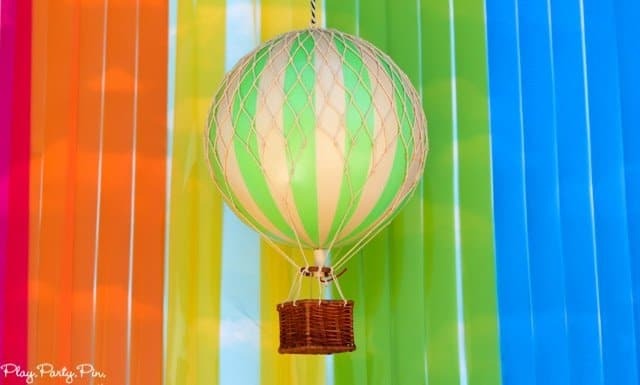 She used a bright green wrapping paper that she found for the table runner and hung balloons throughout the room. The kids had a blast with the DIY photobooth. Kristen’s daughter splattered paint over a white tablecloth and hung it as the backdrop. Kristin ordered skate photo props from Kiki and Company that came just in time. She took photos from her Polaroid camera of each guest; it was a big hit since the kids had no idea what the contraption was! Along with the polaroid photos, the kids took home tons of neon accessories. Kristin listed the link to all the favors she ordered on her blog. For your roller skating party, consider booking a local roller rink for your festivities or taking your guests there for a couple hours to skate around. This is a great way to add physical activity to the party, and get rid of all crazy energy from the sugar! Grab the tights and hairspray for this throwback back to school party, and consider adding to the fun by suggesting your guests wear 80’s fashion. OPERATION: BACK TO SCHOOL is underway with this secret agent-themed party. Cue the James Bond theme song for this special mission organized by Michelle of Michelle Paige Blogs. 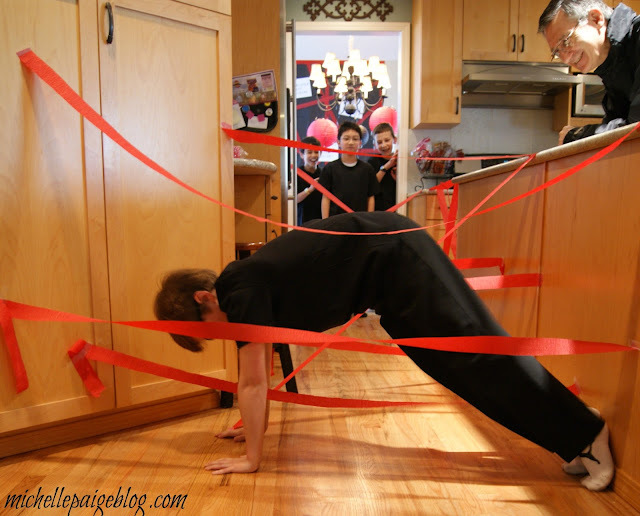 Michelle turned her home into a spy training center for the party for her son. The color scheme for this party was red and black. Each agent received a black t-shirt upon arrival. (An all-black dress code is mandatory for all spies, right?) 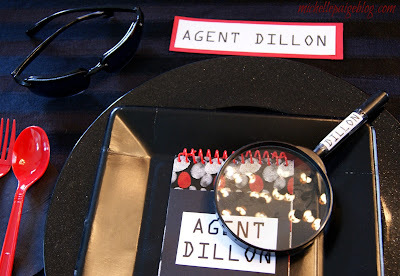 Each place setting was marked with each agent’s name, a magnifying glass, a personal notebook to write secret messages and (of course) some shades. Michelle transformed the play room into the target practice center. She hung balloons from the ceiling as well as a large laminate board with circles for targets. Other activities included a laser beam training with red streamers, code deciphering, a simple photo booth with black backdrop and a team activity to stop a bomb from going off. Michelle had so many cool ideas and kept the kids busy the entire day. 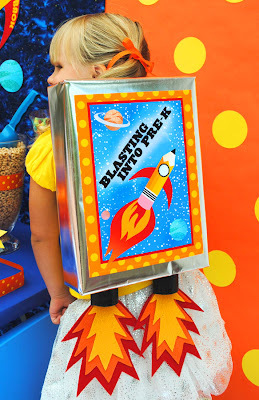 You can see many more ideas featured on her spy kids party blog. This operation is complete and looked like a ton of fun. 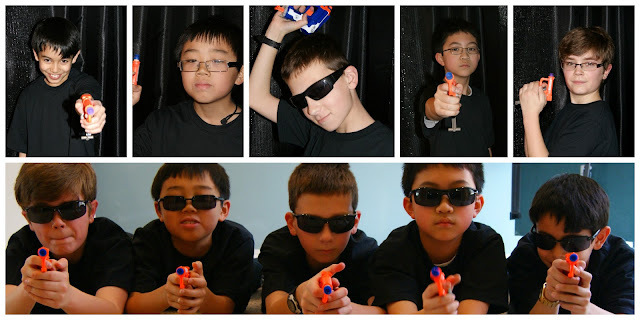 Consider throwing a spy-themed party before heading off to school. Comfy and colorful were two words to describe this fun-filled party for Dusty’s daughter. The mama behind All Things G & D threw a pajama party that had all the kids giggling the whole night. Pajama Day is basically a national holiday at school, so why not bring the fun home before heading off into the new year? Her daughter decided that she wanted to make it a polka-dot theme which makes decorating especially colorful for this one. The kids’ tables were decorated to resemble beds with pillows on each end. She used sheets for the tablecloths and layered them to look like a complete sheet and comforter set. The place settings consisted of brightly colored plates, polka dot placemats and personalized water bottle labels for the occasion. Dusty handmade each child a personalized pillowcase with their name to take home as a party favor. If you would like to do something similar, consider purchasing plain cases and allowing each child to draw with a fabric marker–combining an activity and easy party favor! The dessert table was covered with a polka dot comforter and lots of sweets. She got creative and used doll beds as cookie stands, perfectly tying in the pajama theme! The last detail was an easy-peasy birthday sign that can be reimagined for a back to school party. She hung a sheet on the wall and a garland with the message. 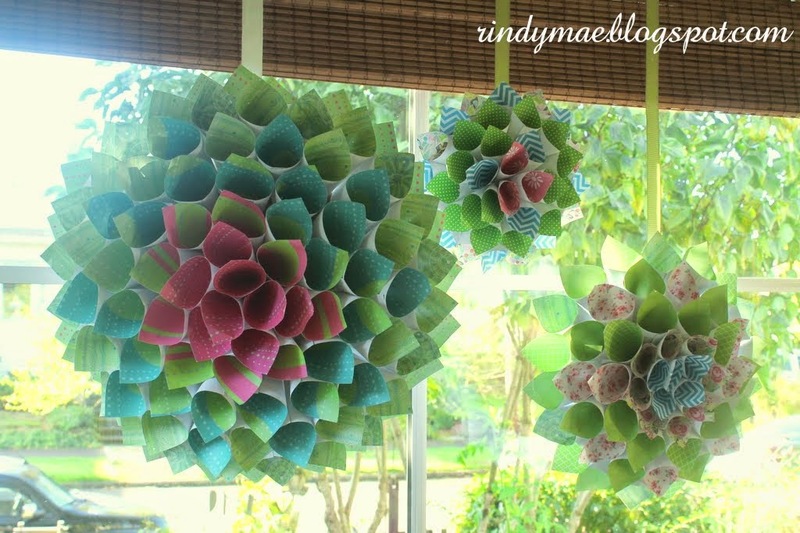 Paper fans completed the look and made the room even brighter. We thought this pajama-themed party would be a perfect way to kick off the new year. If throwing a back to school party isn’t your forte, consider throwing a back to school breakfast for your kiddos instead. Mariah from Giggles Galore created a tradition for her family with a first day of school breakfast to celebrate the upcoming year. Mariah was the bright mind behind the Bookworm party that was mentioned earlier in this post as well. Similar to her previous party, this breakfast had a very vintage vibe with school-themed décor, milk glasses and cafeteria trays. The printables were purchased from Dimple Prints. Mariah opted for a very simple breakfast to kickstart her kids’ first day. She served blueberry muffins, silver dollar pancakes, fruit and yogurt. Each year, she gets the kids a special little present that is school-related such as notebooks, stickers, crayons or bookmarks. This simple back to school breakfast has become a beloved tradition in their household and gets the kids excited about the upcoming year. We’re ready to ride into the new school year with this bicycle-themed back to school party. Morgan from The Family Chapters planned a wheelie awesome bicycle-themed party for her daughter. Guests were encouraged to BYOB (bring your own bike) to ride around in the multi-purpose room she rented from her local park. The main color scheme was inspired by Julia Rothman’s “Ride” fabric that Morgan used for accents in pennant flags and on the tables. She covered the dessert table using a light pink tablecloth that tied in nicely with the various colors. Morgan is one crafty chick and created her own pom-poms with yarn. To fill up some of the wall space she found some bike images on Pinterest that she saved in Photoshop. She then took them to FedEx Office and used their Oversize self-service printer to print huge bike posters ($.79 a s/f). The posters were a huge focal point in the space and such an easy way to decorate. She borrowed the blue bike from a friend, tied some balloons to it and BAM—a rockin’ centerpiece. She hand-painted her daughter’s name to put on the table and hung pennant flags from the basket. 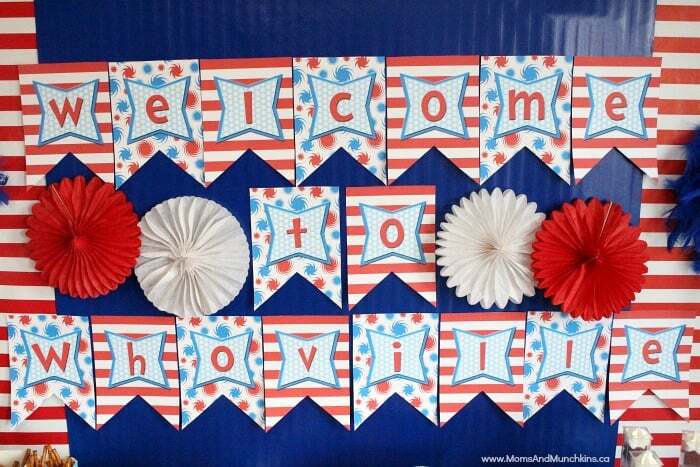 For your back to school party, consider incorporating your child’s name, school or grade into the décor. Aside from riding bikes for a majority of the party, there was also a decorating station where the kiddos could add bike baskets, beads, spokes and handlebar tassels to their bikes. The wire baskets were purchased from Dollar Tree and she got zip ties for all the kids so they could attach them. When it came to food, this party had TONS of sweets. Aside from being crafty, Morgan is also a baker and made the adorable bicycle sugar cookies. The macaroons were purchased but she drew the wheels on with an edible pen. For favors, the kiddos took home bike baskets and their own bicycle-shaped straw. After riding out all of their energy these kids were pooped. Morgan threw an awesome party and we adored every little bicycle detail. We hope your kid is ready to ride into the new year and has a wheelie good time. You donut want to miss out on celebrating the first day of school with this adorable donut-themed party. 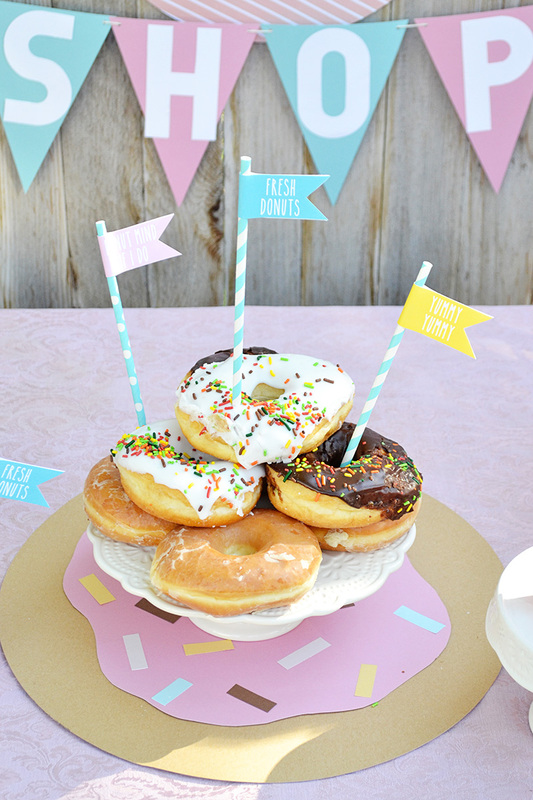 Aly Dosdall is super crafty and made a DIY donut party that can easily be recreated for a back to school party. 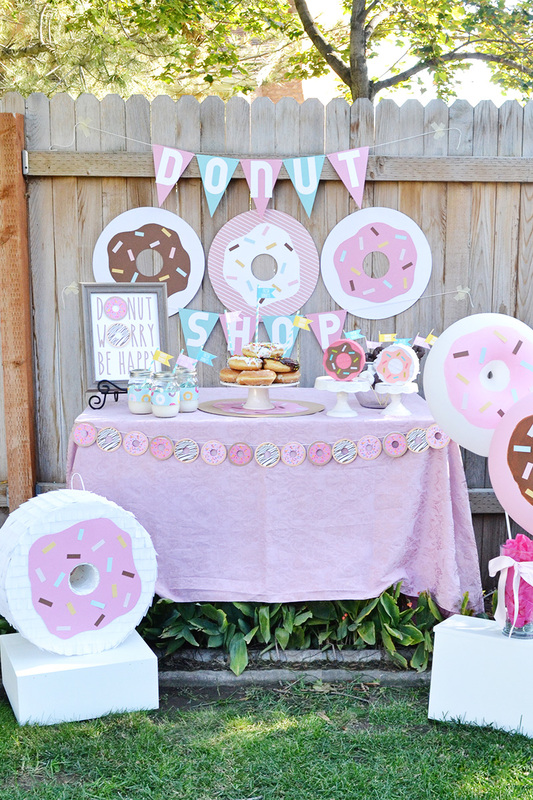 Aly created a fun and inexpensive party backdrop using pennant flags, lots of pastels and donuts. She created her own pennant flags using pink and blue cardstock on her Banner Punch Board. The “Donut Shop” letters were created with her Alphabet Punch Board or you can purchase die-cut letters inexpensively. To create the large donuts on the table, she cut circles from poster board. She then free-handed icing using cardstock and used various scraps from the pennant banners to create sprinkles. This is such an easy DIY and turned out so cute! 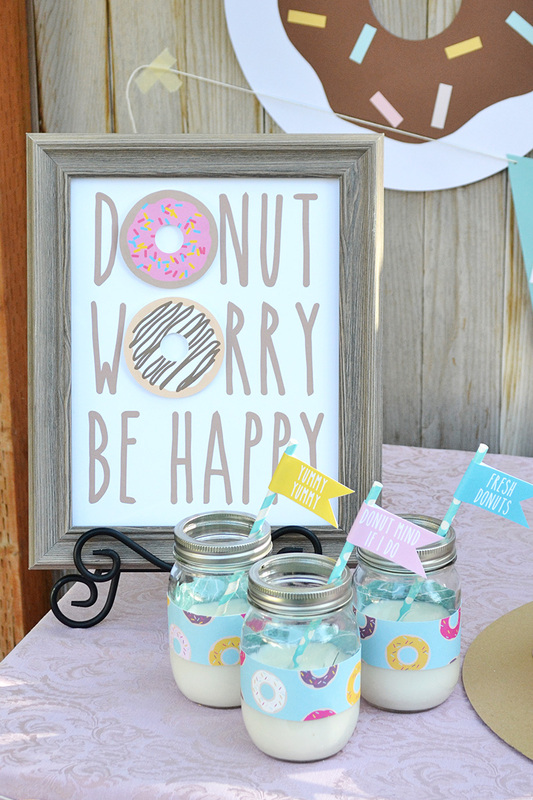 She used a simple pink tablecloth for the table and added a framed picture that said “Donut worry. Be happy”. The donut garland was created using CD labels and twine. Who would’ve guessed that it’d be that simple? Mini piñatas are becoming a staple in Aly’s parties and she created a video tutorial on how to assemble these little guys. Supplies for this DIY included mini circle piñatas, blossom and white fringe tape and cardstock. Aly surprised us with her darling donut balloons she created using paint, balloons and washi tape, making this budget-friendly and so easy. For the actual food on this darling table, she picked up some donuts from a local bakery and decoratively stacked them on a cake stand. She made adorable little flags that she attached to paper straws to add a little flair. Donuts wouldn’t be complete without milk, so consider using mason jars or glass bottles to add a vintage vibe. This darling party was so simple and crafty. Aly you blew us away. If you’re looking for an easy and yummy back to school party, then look no further! Minecraft is taking the video game world by storm with its creative possibilities. With kids being able to create whatever they like with simple blocks and pixels, it’s no wonder that so many kids are obsessed. Your child may be trading in the controller for a pencil, but why not throw a Minecraft-inspired back to school party to remind them to carry their creativity into the upcoming year? Holly from Paper Crush showed us her nephew’s Minecraft-themed party to celebrate his birthday. For the color scheme, she kept true to the theme of the game with greens, tans and browns. The decorations were based onof the pixel format within the game. Our favorite element of this party was the large creeper character made completely out of square paper plates. You could also use scrapbook paper or construction paper cut into squares. Holly’s sister-in-law hung tissue tassels on each side to add flair to the space. She hung a fun birthday banner in the party area. For your back to school party, consider a more basic Minecraft banner. The backdrop for the dessert table was an easy DIY project. They painted cardboard boxes in greens, tans and browns and stacked them on top of one another. The desserts were taken right out of the game including cupcakes with Creeper toppers and coordinating wraps, chocolate cake pops, cookies and grass-covered Rice Krispie treats. The kiddos took home green, tan and brown varieties of candy in clear cube boxes as favors. This simple Minecraft-inspired party is budget-friendly and perfect for your Minecraft-obsessed kiddos. Bold, bright and fun were three words to describe this circus-themed party by Nancy of A to Zebra Celebrations. Nancy’s daughter begged for months for a circus-themed party and she delivered an over-the-top extravaganza that will transport you right inside the tent. The invitations, printables, tags and labels were designed by Anders Ruff to coordinate with the bright and colorful theme. The center stage for this party was a round table for gifts and party hats that guests could grab when they walked in. She laid a pink tablecloth with a polka-dot runner onto the table. 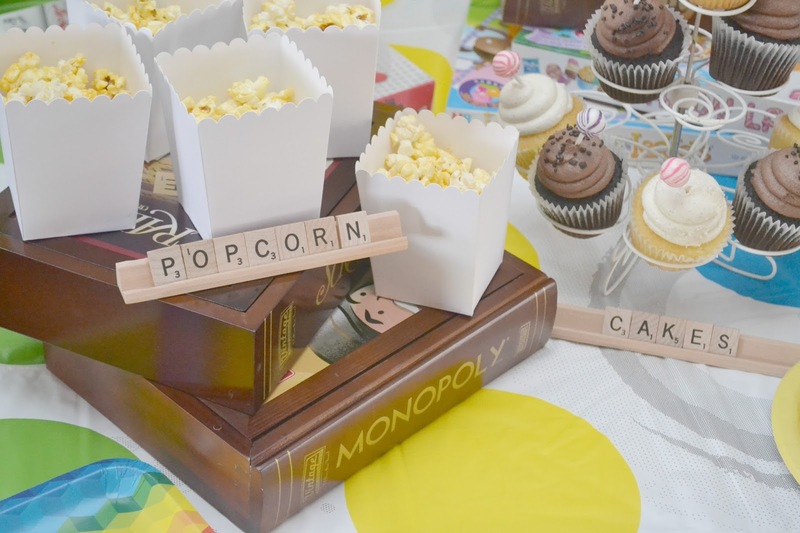 The printables from Anders Ruff were customized for the party and can be repurposed for a back to school party. This party was full of sugar–a whole two tables of it! Nancy made a dessert table with a cake, cake pops, cookies and more! The table was kept simple with a blue table cloth and polka-dot runner. She made a ribbon backdrop using PVC pipes as the frame. This is an easy project and adds such a colorful touch to the space. Nancy’s mom is also crafty and created a clown piñata for the party. Nancy created a candy table full of tons of sweet treats. She purchased a “Candy Shoppe” decal and stuck it on a poster board. We got a sugar rush just looking at it! The guest table was super fun with lots of color. She kept it simple with a white tablecloth and another polka-dot runner. She used different color plates and topped them with a polka-dot paper plate to tie it all together. Each guest received a party hat with a clown nose on top. Each chair was decorated with a marabou boa and balloon. A circus party wouldn’t be complete without some fun games! The kiddos had a blast playing spin the wheel, bean bag toss, ring toss and three in a row. Nancy hired a face painter for the party and they had a blast! The party was made complete with a photobooth using a simple tablecloth as a background and props; lots of Big Top memories were made. We’re not clownin’ around…this circus-themed party was one for the books! Watch out parents, you’ll want to wear shoes for this one–don’t wanna step on one of these little guys. Legos and building blocks are a staple in most playrooms, so why not create a whole party that will have kids building and playing the whole time? For this back to school party, we stepped into the Legosphere. Mallery from Horrible Housewife used Legos as her inspiration for her son’s party. Due to its very simple theme, this party can easily be recreated for the back to school season. As far as a color scheme goes, Mallery incorporated primary colors to keep with the main colors within most Lego sets. She hung paper fans from the ceiling to serve as the backdrop. The most stunning piece of the table was the large number one “1” that they built. Consider, recreating your child’s grade or initial for their back to school party. She found a LEGO coffee mug that she used to hold the cutlery, and made cake risers using empty boxes, foam circles and plain paper for wrapping. Her food was very creativity executed and was all shaped or related to LEGO’s in someway. Some of the creations she came up with were LEGO graham crackers, Ants on a log, LEGO brick cakes and much more featured on her LEGO party blog. In an effort to be practical and play up the LEGO theme, Mallery picked up storage containers from her local dollar store and filled them with LEGO brick crayons, LEGO brick gum, and small LEGO brick containers of color coordinated M&M’s. She created a tutorial for her favor boxes so that you can recreate them for your back to school party. 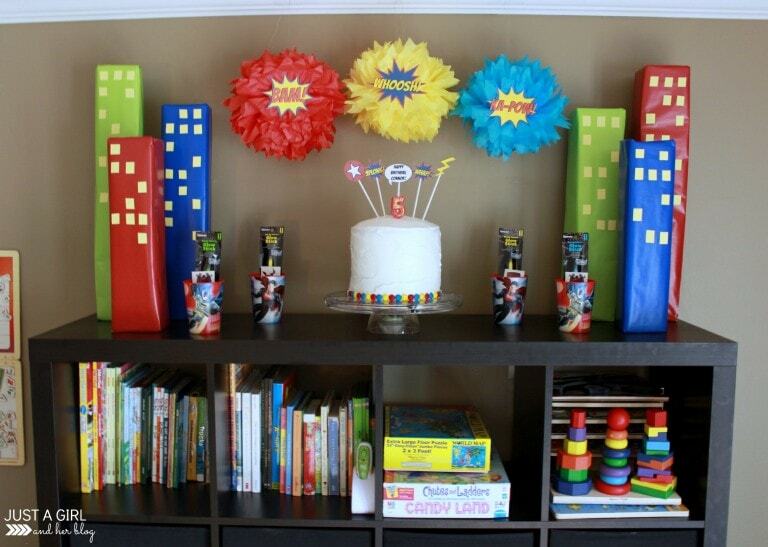 This Lego-themed back to school party from Mallery was bricktastic! 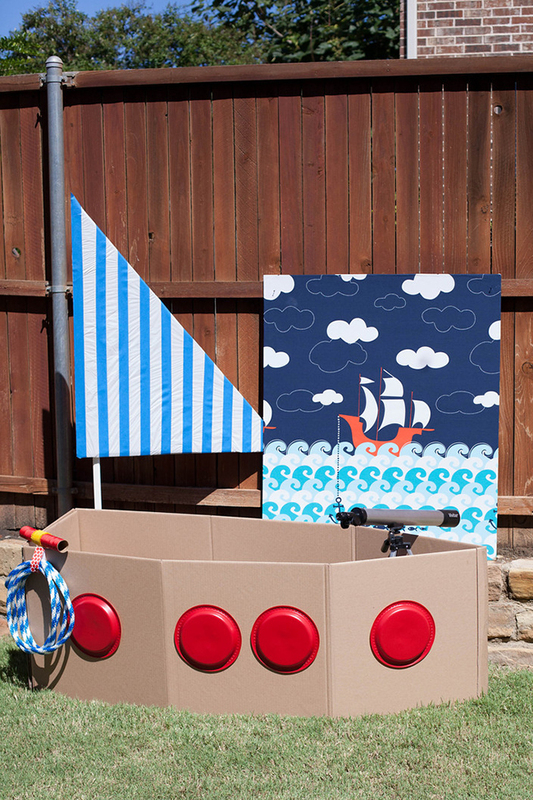 We’re setting sail for the new school year with this nautical-themed back to school party. Heather, founder of Chickabug, invited us aboard for this party thrown by her friend, Jenn, for her son’s birthday. 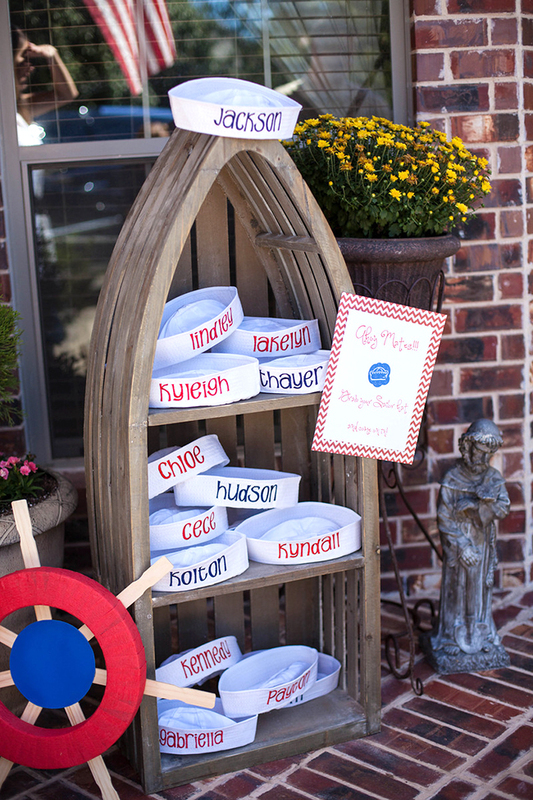 Jenn’s nautical-themed party was a perfect way to celebrate her son’s milestones. 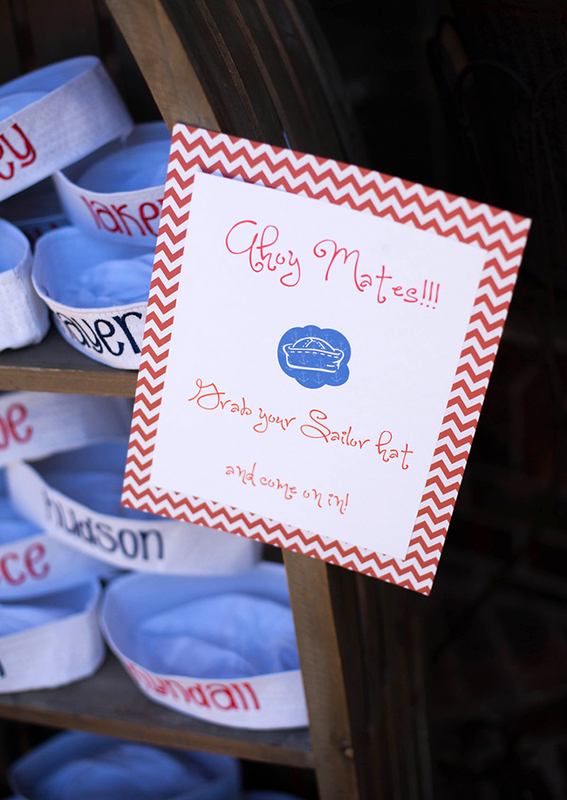 Upon arrival to the party, each child received an adorable embroidered sailor hat from Miss LuLu’s, a Texas-based shop that accepts online orders via email. Jenn made a sign that said “Ahoy Mates! Grab your sailor hat and come on in!” that was placed next to the entrance. 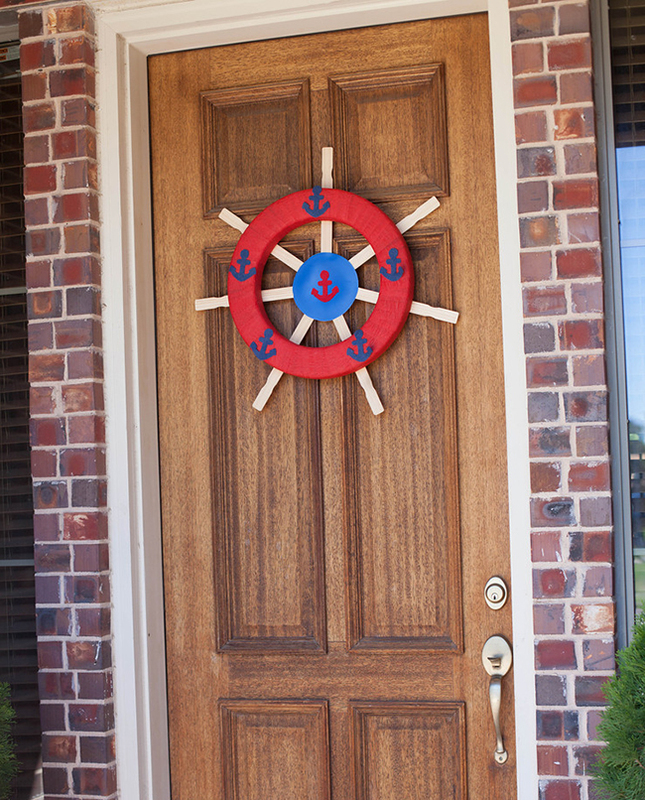 Jenn showed her creative side with her DIY nautical wreath that was hung on the front door. She made the wheel using a Styrofoam ring wrapped in red yarn, cardstock and wooden paint stirring sticks. This was so clever and fit perfectly with the theme. The backdrop for the food table was very simple. She used red chevron fabric as the base and sewed anchor patterned fabric to the edge. Jenn scored on this large wooden anchor find. We found similar large anchors to choose from with the possibility of being able to paint them to fit your color scheme or personalize for your child. Jenn created a table garland using strips of coordinating nautical fabrics. We adore the red, white and blue color scheme that was used throughout the entire space. The creativity continued throughout the food table with her quirky names: marshmallow buoys, life preservers, anchor bites, catch of the day and more. 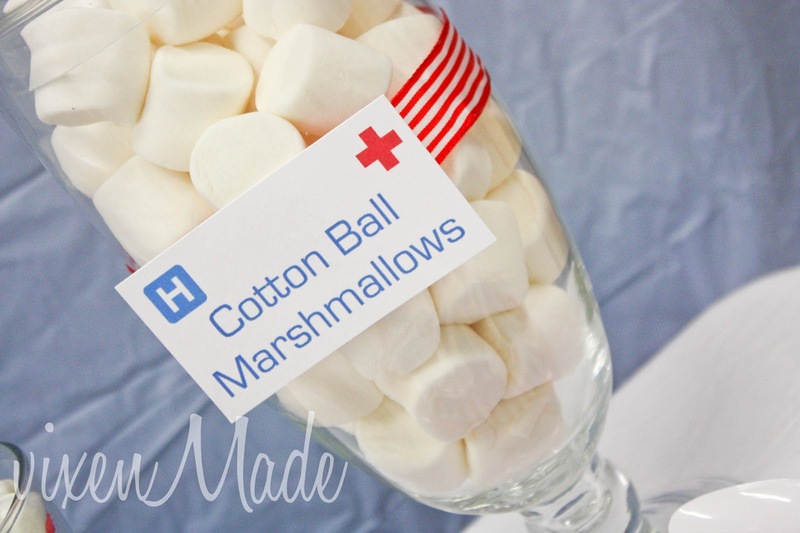 She used nautical party printables from Chickabug to label the foods and water bottles. Jenn created a DIY sailboat that ended up doubling as entertainment and a photobooth. She found a sailboat-themed fabric that she attached to a piece of plywood using spray adhesive. The kids loved the boat and looked like sailors with their little hats. With the help of Heather, the party favors were a hit. Each kid created their own snow globe aquarium to take home. 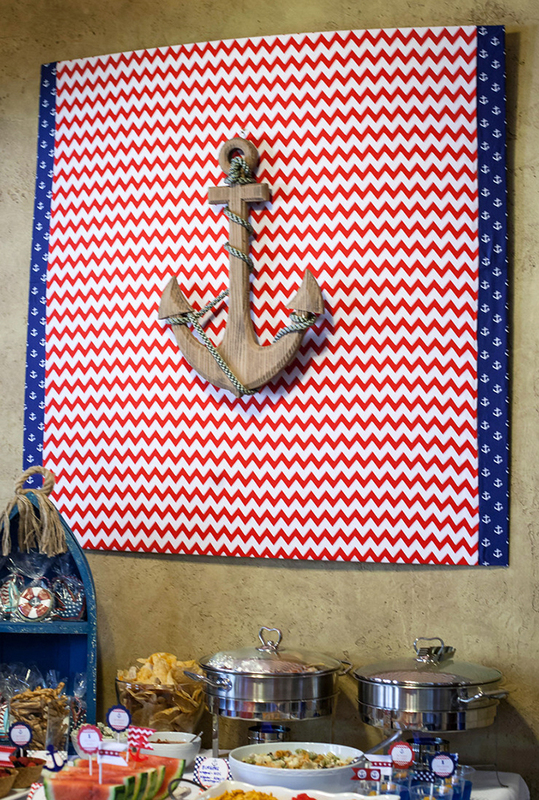 We’re riding the waves back to school with this nautical-themed party. Jordan from Kojo Designs transported her daughter’s friends across the globe in a matter of hours along with help of her sister, Kristin. You’ll want to grab your passports for this around the world party. Learning about geography in school is a really cool experience because for the first time, kids are learning more about other cultures and places that they didn’t even imagine existed. The inspiration for the invitations was taken from a vintage poster of the film: “Around the World in 80 Days” and she really nailed it. Most of the décor for this party would fit into the vintage category with lots of maps and flags that were transformed into labels, garlands, party hats, favor bags and more. Kristin went thrift shopping and scored on a 1970’s geography textbook which made this project extremely simple with plenty of ideas. This party included passports of fun with layovers in each country to do a fun activity. The kids carried around their passports and received stamps along the way. The final stop was the “bonbonerie” a.k.a. the dessert table filled with sweets from all over. The kids went crazy and filled their map favor bags with tons of treats. The garland was made using maps from the textbook with hand drawn letters by the sisters. The kids used maps to create their own paper airplanes to fly around. Jordan also created a hot air balloon sign of her daughter’s name using cardstock. For your around the world party, consider using your child’s name or school to tie into the back to school theme. This party was so, so creative and budget-friendly. 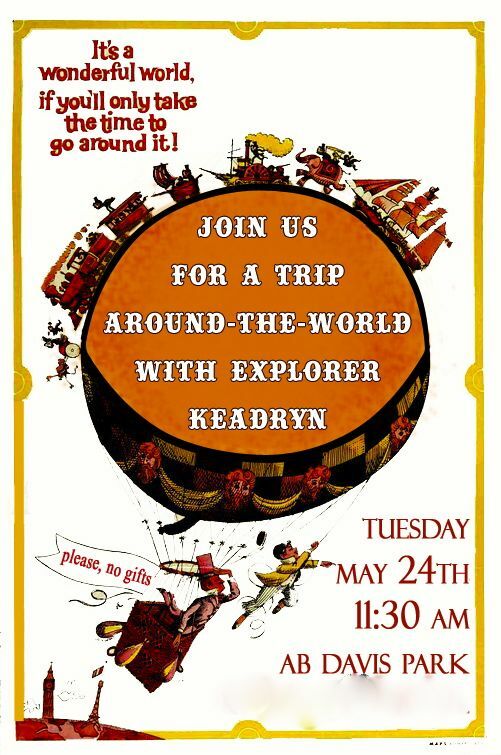 We hope this party not only gives you the traveling bug, but also inspires your kiddos to learn more about geography this upcoming school year. 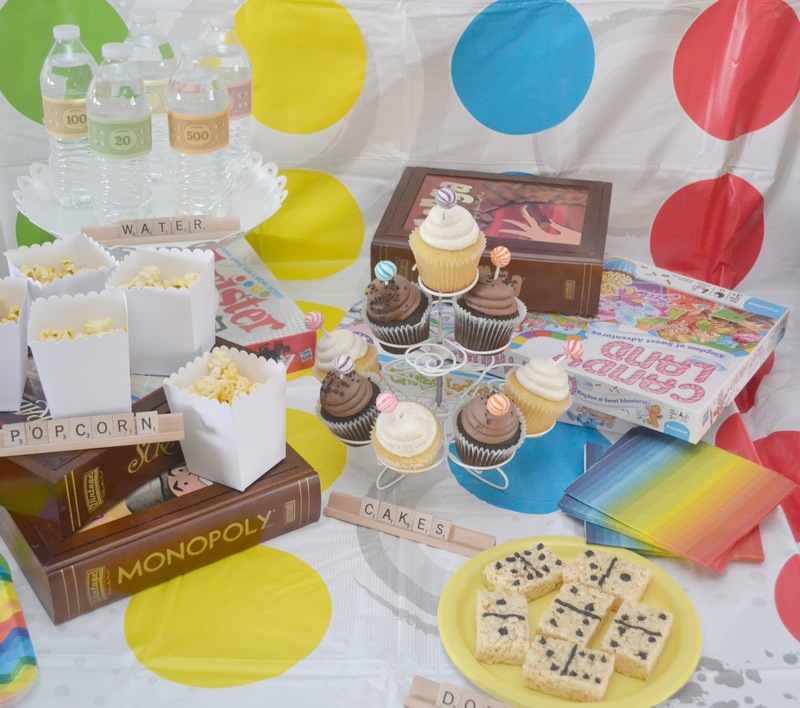 Going back to school is sweet, but this Candy Land-themed party is even sweeter. 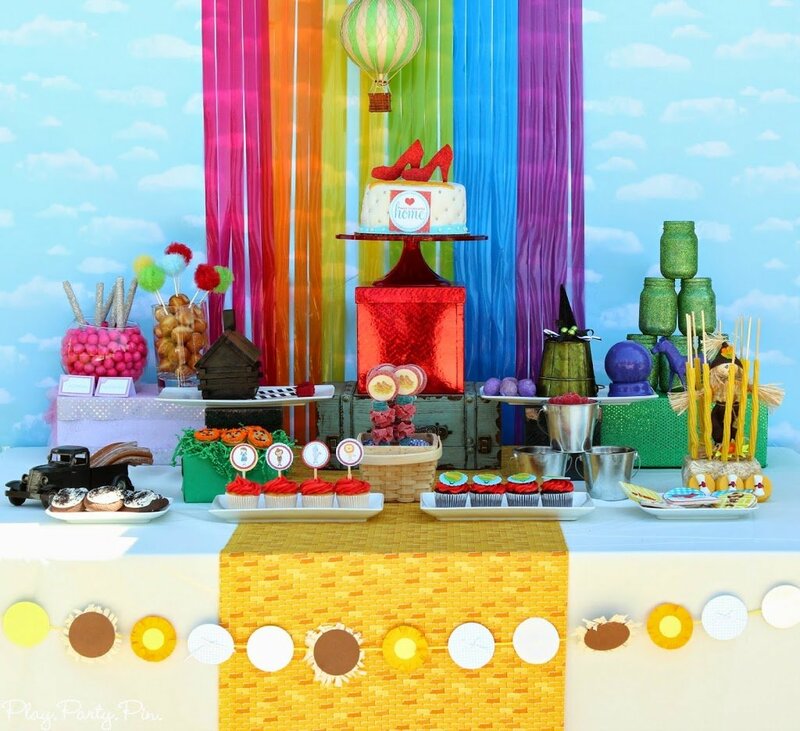 The brains behind The Little Big Company inspired us with their bright, vibrant and nostalgic Candy Land-themed party. Playing Candy Land is an iconic part of most childhoods with the easy instructions and bright colors. Since this party was going to be packed full of color, the backdrop for the dessert table was kept simple. The design was hand-drawn by Amy Greenwood from The Mural of the Story; you can easily get this personalized for your party with your child’s name. They added paper fans around the edges to resemble little candies. Balloons were placed on each side of the table with game cards attached to the string. They also circled the table with rectangle card stock to resemble the game board–an easy DIY and decoration to tie in with the theme! This party was full of many elements of the board game but with their own twist for the child’s personality. They created “Princess Frostine’s Rice Krispie Popscicles,” “Gloppy’s Oreo Pops” and “Lolly Woods”. Our favorite detail of the dessert table were the chocolate covered oreos that featured the fondant Candy Land game pieces on top. This table was packed full of tons of sweets! 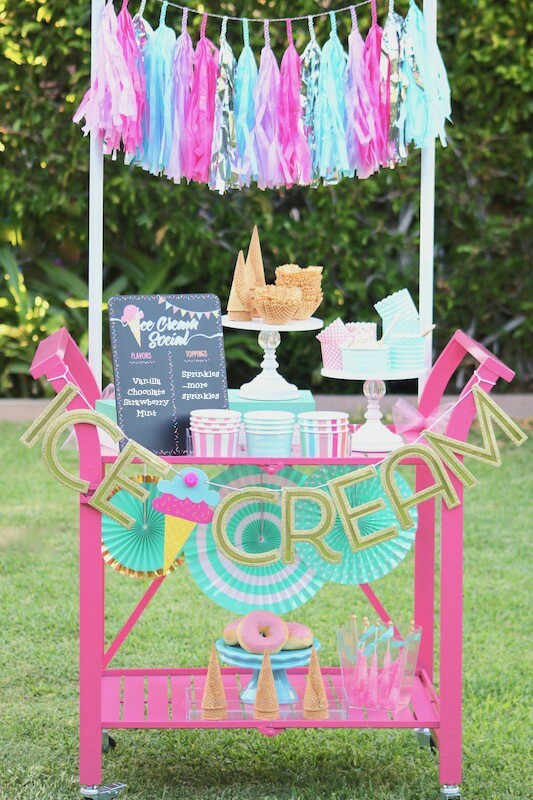 We definitely have a sweet tooth after this Candy Land-inspired back to school party. Giddy up for this wild west-themed back to school party. Mae from Custom Mae’d partnered up with her friend Carolina of Mint Event Design to create an incredible wild west-themed party to celebrate another year. The rustic backdrop was created from scratch by the team over at Mint Event Design using stained wood and nailing rope in the design of the child’s name. The color scheme for this party was kept very neutral with brown tones in the burlap and highlights of red from bandanas. 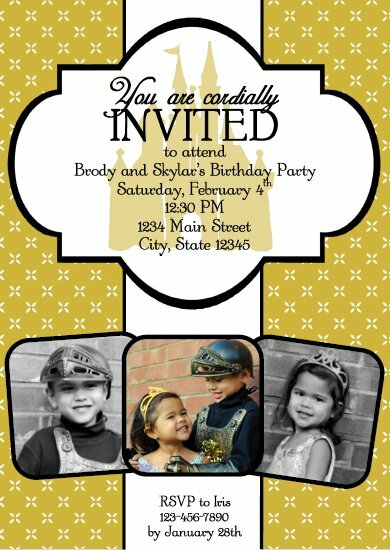 Mae created the printables for this party including the labels and birthday banner. Consider contacting Mae for personalization of your banner to fit the back to school party theme; she is so creative! 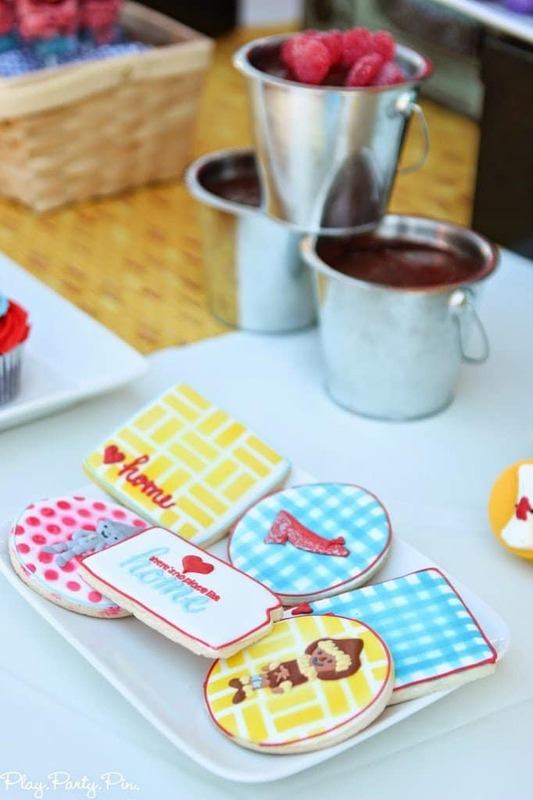 Sheriff badges were the main symbol found throughout the dessert table and were even featured with Mae’s son’s name on the cupcakes–too cute! The rustic wagon, provided by Mint Event Designs, featured a sign by Mae that said “Grab your grub partner” to tie in with the wild west theme. Go on now, y’all–it’s time to plan the perfect wild west-themed back to school party before the kids get too wild. When life gives you lemons, you throw a lemonade-themed back to school party to say goodbye to summer. Michelle from Michelle’s Party Plan-It is back with her lemonade stand-inspired party to celebrate the summer months coming to an end, and school starting back in full swing. This party was both bright and simple with a pink and yellow color scheme, a few coordinating decorations and tons of sweets. Michelle started with a pink and yellow tassel backdrop. She topped the table with white hand-painted crates and scattered various lemon-themed décor and dainty flowers around the table. Michelle adores paper lanterns, so she set out clusters of pink and yellow lanterns to add to the theme. She found lemon wedge balloons that she blew up and incorporated into the space, and set out coordinating paper straws and milk glasses for the lemonade. This bright and colorful party was both simple and budget friendly. Saying goodbye to summer doesn’t need to be sad but can be celebrated with this super cheery lemonade stand-inspired back to school party instead. Whether you consider yourself a dog person or a cat person, you’re going to love taking a trip to the pet shop with this pawsome party. 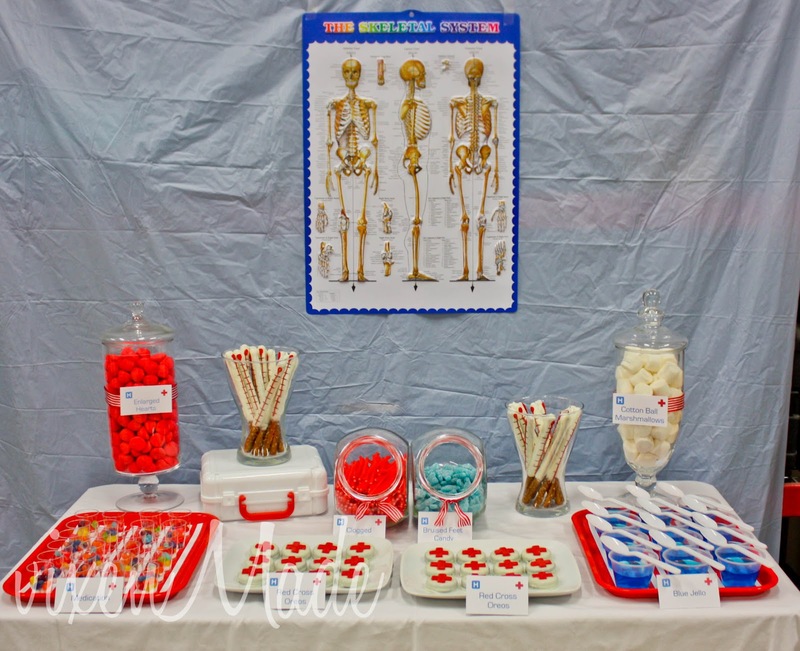 Cheryl from Moms and Munchkins created a grand opening celebration for her pet shop-inspired party, making this a perfect theme to celebrate going back to school. 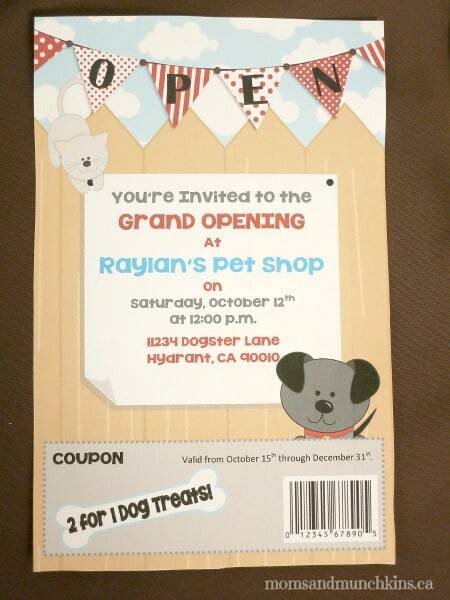 Since this is a pet shop-themed party, the inspiration for the invitations was a flyer for the grand opening of the shop. Cheryl even added a coupon to the bottom of the invite. She suggested adding a “Coupon Zone” at the party where guests can pick up the product advertised to keep as a party favor. The decorations for this party were very simple. Cheryl created an open sign for the front door to greet guests when they arrived. For the party backdrop, she alternated plain and polka dot streamers to add dimension to the space. 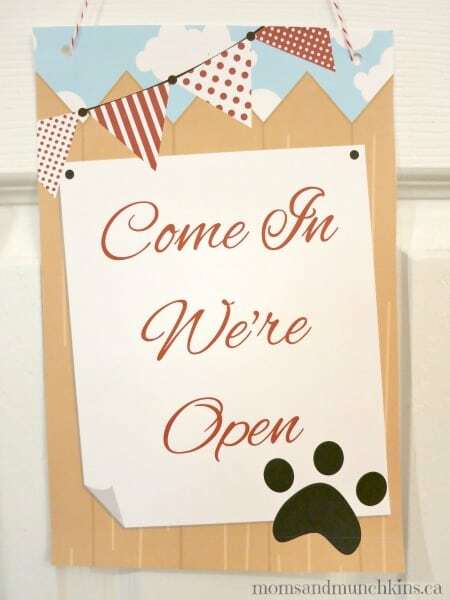 She also suggested adding paw print streamers to create a store front awning above the table. She incorporated various elements of pet supplies to the space. She found birdcages and stacked them on tall candlesticks to add height to the table, the cages were filled with fake feathers. Consider adding stuffed animals, dog toys, balls of yarn or hamster cages to add more of a pet shop feel to the space. Activities for this party included dog training, “trainer says” and yarn soccer. These pet-inspired twists on traditional party games are a fun way to contribute to the theme. She included materials and directions on her blog. 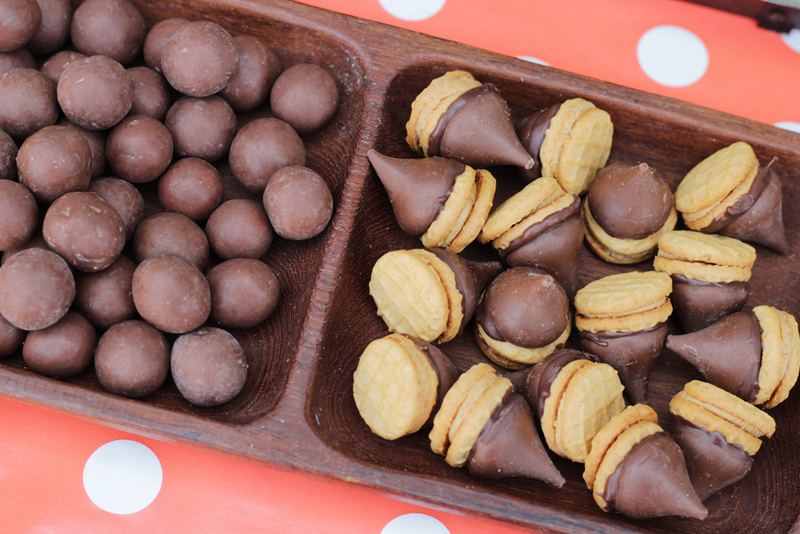 These pet-inspired treats were the hit of the party. She served a variety of creative foods that didn’t taste like dog food. She recreated hamster shavings by placing potato chips into snack bags. Granola bars were labeled as “Bird Feeder Granola Bars” and she used a dog bone cookie cutter to create dog treats. Cheryl incorporated cute critters with cake pops in several different animals. The kiddos drank from mini fishbowls with paper straws–which is a super photo-worthy cute idea. No party would be complete without a doggy bag. Each guest took home some party favors. Cheryl used dog house favor boxes from Simply Everyday Me that were filled with whistles, small frisbees and a stuffed animal. This pet shop-inspired back to school party was pawsome and has us ready to wag our tails for the new school year. This vintage back to school party takes us back to the school yard. Kara from Kara’s Party Ideas planned a vintage schoolhouse party that she held it in front of a historic school. The main focal point of the party was the vintage yellow desk with alphabet garland. The desk served as the food and refreshment table. The kiddos enjoyed sack lunches, milk, red apples and scrumptious apple cupcakes that were so yummy! The faux cake was stacked with school supplies with vintage labels created by Kara. She used a vintage penmanship poster as the backdrop that added to the theme. Kara incorporated milk bottles, books, wooden spoons, globes and chalkboard signs into the décor. 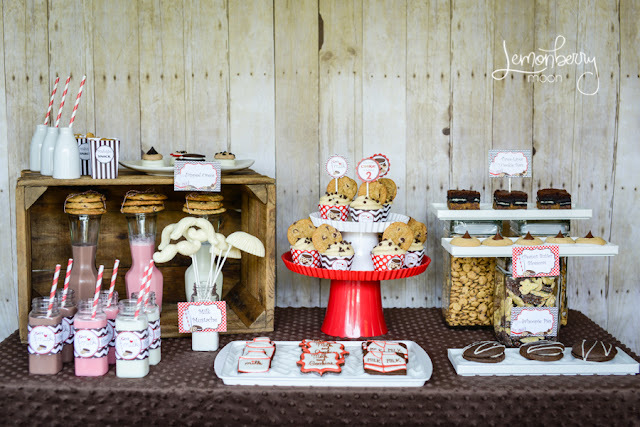 The various elements that she incorporated made the vintage schoolhouse party come together. The kids took home alphabet letter magnets and sweet treats. Encourage your guests to dress in old-fashioned school attire, such as these darling dresses that the girls were wearing are from Lolly Kate. We give this party an A+ with its vintage charm and old school feels; this is the perfect way to celebrate another year of learning! We’re dreaming of spring in this garden and floral-inspired party. Mindy from Rindy Mae threw her daughter a flower party with burritos, because that’s what her daughter wanted–and that’s what she got. Besides the yummy food, this party was full of tons of décor that made us feel like we were in a garden. The decorations for this party were bright and cheery. Mindy handmade paper dahlias that she hung from the ceiling using ribbon. These added a whimsical touch to the space. 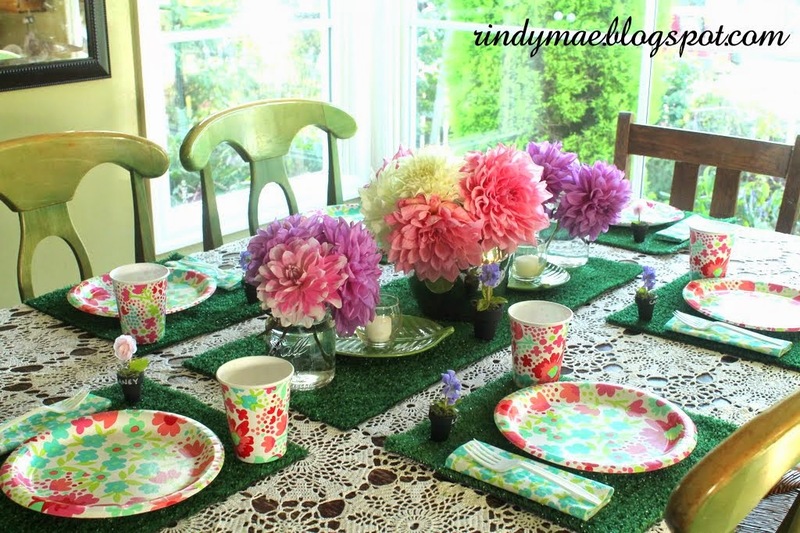 For the table, she used fake grass that she cut into placemats and a table runner. Since Mindy is a gardener, she had a supply of flowers in her own backyard for the centerpieces. She scored on the floral cups, napkins and plates on a Target run. 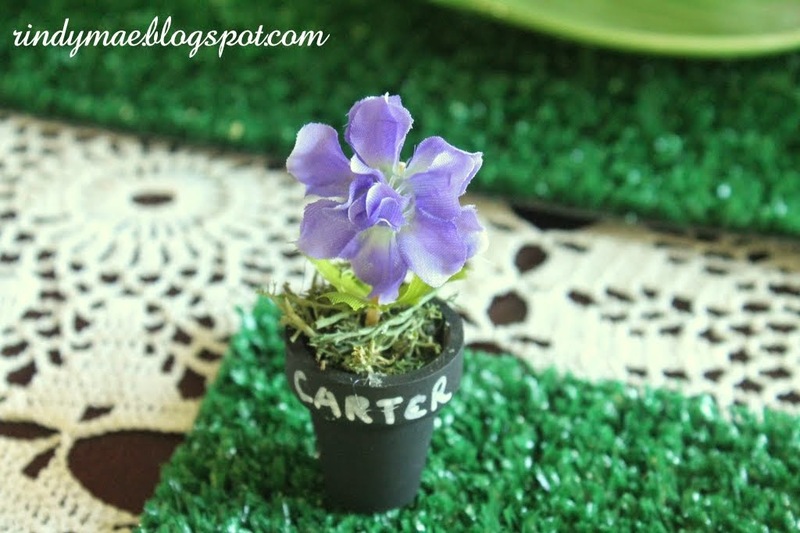 Our favorite detail of the table were the miniature flower pots that she used to write each child’s name. These were an easy DIY by painting flower pots with chalkboard paint and floral foam. She wrote each child’s name with a chalk pen and stuck a flower in the pot. Aside from crafting and gardening, Mindy is also a talented baker and created tons of sweets for this flower party. 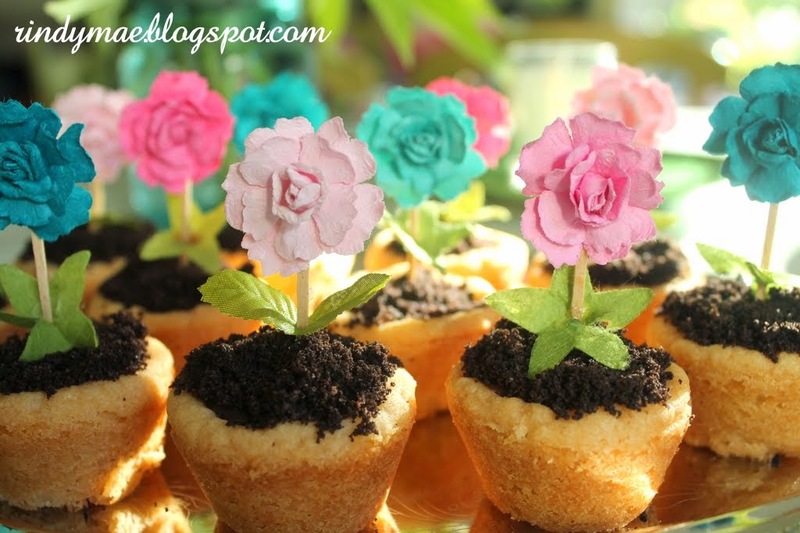 Her cupcakes resembled flower pots and were too cute! She made cupcakes with crushed Oreos to resemble dirt and topped it off paper flower stickers that she glued to toothpicks. This flower and garden-themed back to school party was darling and perfect for any child with a green thumb. 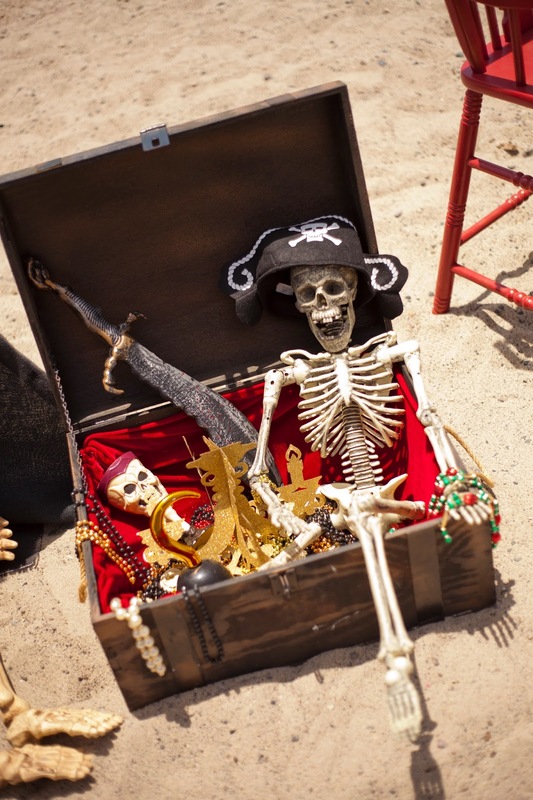 Finding this adorable pirate-themed party was like finding buried treasure! 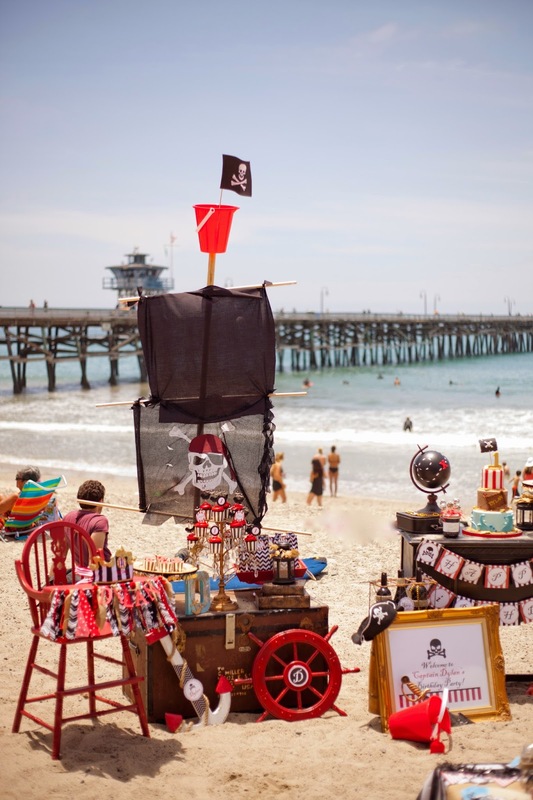 Laura from Laura’s Little Party threw a pirate beach bash for her little one’s birthday, but you don’t need a beach to recreate all these great ideas! 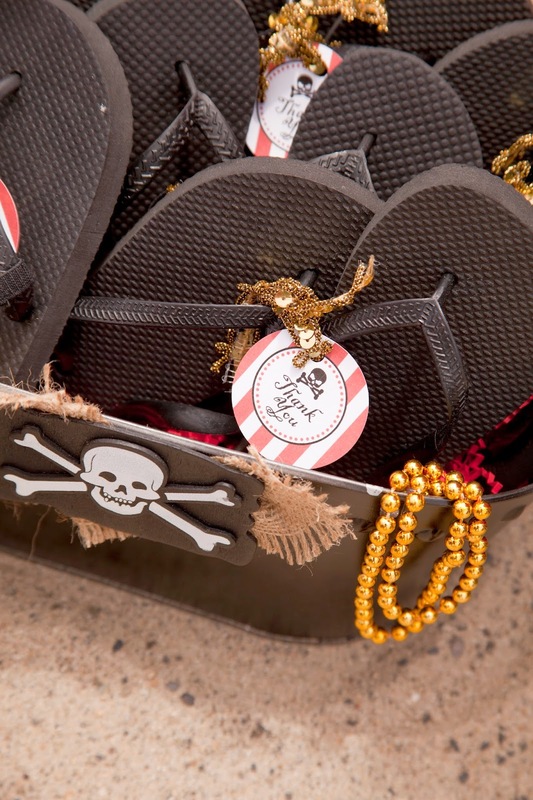 The décor for this party was full of lots of DIY’s you can make for your own pirate-themed back to school party. When guests arrived, they traded in their shoes for brown flip flops and pirate swords that Laura provided. She asked for everyone’s size ahead of time which made this little favor a breeze! Laura went all out for this party. 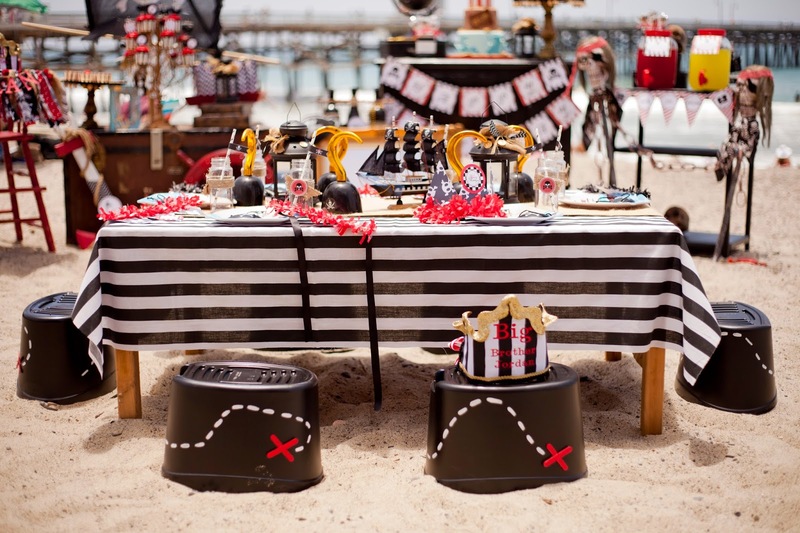 The tablescape features a black and white striped tablecloth with a burlap runner, pirate ship and black lantern. She provided eye patches and pirate hooks for each guest before enjoying their feast. For seating, Laura was creative and repurposed buckets that she painted black and drew a map trail. Everything for this party coordinated perfectly. She created the ship’s mast using dowels from her local hardware store, screws, black fabric and a beach pail. 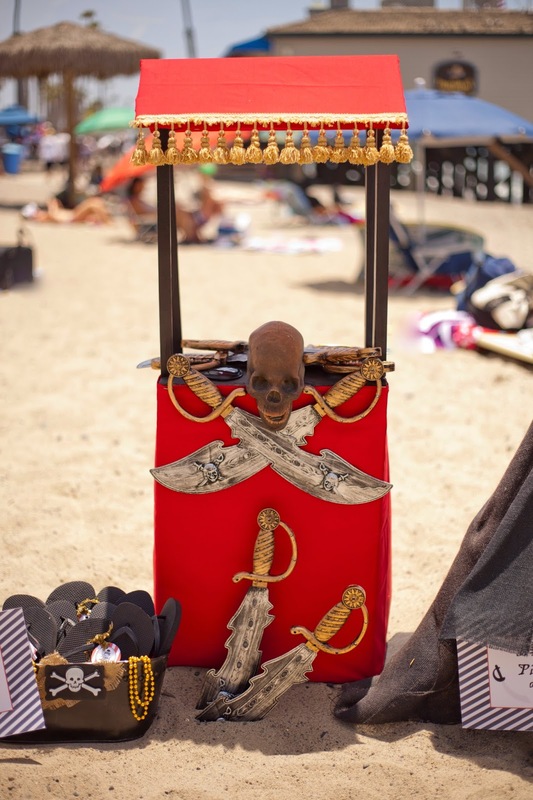 She hung a perfectly deconstructed pirate flag for the final touch. Other fun elements for this party included hand-painted mason jars for the yummy pirate suckers, a black globe with an hand-painted map trail and a personalized “D” for the birthday boy from Tancy’s Creations. 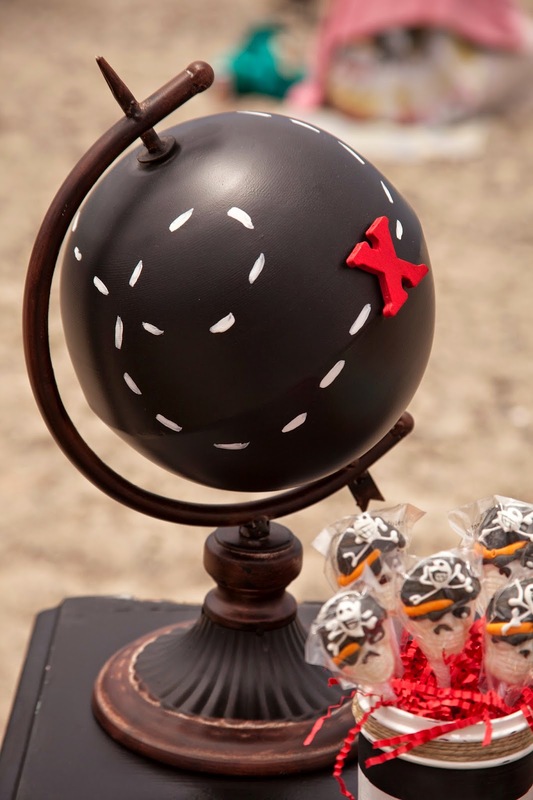 With so many creative ideas, Laura’s pirate-themed party was argh-mazing. Her little ones will certainly remember this beachy bash with friends and family. For your back to school party, consider incorporating other fun learning games and activities for your little pirate. This bright, neon party was full of laughter and a whole lotta fun. 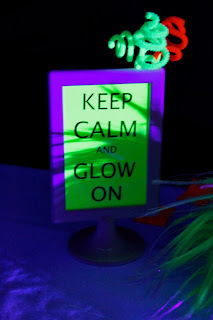 Laura from Three Little Birds’ Events inspired us with her glow-in-the-dark party. The kiddos had a blast in the blacklight environment exploring the different colors. The food table was full of lots of treats and chicken nuggets (a.k.a. a kid staple). She used a white tablecloth to contrast against the neon tissue paper tassels and backdrop. The backdrop can easily be recreated using a large piece of plywood and neon duct tape to make stripes. The kids’ table kept up with the theme with neon placemats and centerpieces with glow sticks¾a décor item she repurposed in a multitude of ways due to their unique ability to bend into different shapes. They were also a great party favor! Laura created a garland using neon paper and twine, but you could also use post-it notes. For your party, consider incorporating a banner with a back to school message or your child’s grade. This glow-in-the-dark-themed party was a blast! For your own glow-in-the-dark back to school party, consider encouraging your guests to wear whites, or bright colors so they’ll glow too under the blacklight. You gotta catch all these awesome Pokémon-inspired party ideas from Sarah of Bombshell Bling. This party was perfect for any poke-lover with all its fun and DIY details that were so simple that even Sarah’s son helped her along the way. The color scheme was red and yellow with hints of blue. She created table and ceiling garlands using various Pokémon cards. The main decorations for this party were red tablecloths, a yellow tablecloth used as the backdrop for the food table and foil swirl decorations that she hung from the ceiling. One thing that has become a staple in Sarah’s party are placemat printables that she gives each child to sit and do while the party guests arrive, it’s a nice way to keep everyone busy. She found a Pokémon-themed activity sheet to tie in with the party theme. Once all the kiddos arrived, each one received a trainer belt like they do in the games in show to hold all the Pokeballs. Sarah created all of these using ping pong balls, spray paint and electric tape; she explains her process in her Pokémon party blog. With this many kiddos, games are necessary to help channel all their energy. They raced, played pin the Pokeball on the Charizard and hunted for Pokémon that Sarah and her husband hid throughout the backyard. After all the festivities, they took home trainer badges and Pokémon cards. If your child is obsessed with all things Pokémon, then this may be the perfect back to school party for you. Janine and her friends at Evermine inspired us with this solid gold music-themed party. The bold table background was a gold fringe curtain with music note cut-outs. Janine hung pictures of her daughter through her first year of life. Consider adding pictures of your child’s first-day-of-school photos throughout the years to create a garland. She labeled the food with table cards and music title puns such as, “Sweet Dreams Are Made of Cheese” and “Strawberry Fields Forever.” Her table was covered with a black and white polka-dot cloth to contrast with the gold. This music-themed party hit a high note in the creative department with limitless possibilities. You could hang thrift store records from the ceiling to add more to the theme as well. This back to school music party is sure to be a smash hit! There’s no place like school in this Wizard of Oz-themed party from Britni of Play. Party. Plan. This brightly-colored party literally takes you on a journey through the film with every yellow brick road, tornado, munchkin and ruby-red slipper. All Britni’s labels, printables, invitations, and cupcake toppers came from the talented Donna of Swish Printables. She has a Wizard of Oz printable set available on her Etsy shop. Britni’s décor was a marvel to say the least. She went all out for this party and the result was a-maz-ing. She used cloud wrapping paper as the base for her backdrop and covered it with a rainbow curtain that she found at IKEA. If you’re feeling a little crafty for your party, an easy DIY would be hanging streamers from the ceiling in various lengths to create a similar look. The hot air balloon was the focal point of the table and ties into the theme. The place settings for the tables were very similar to the colors found in the backdrop. She added blue gingham napkins to match Dorothy’s dress from the film. The yellow brick road was tied into the table by using fabric as a runner. Her friend, Stacie from Fancy and Fold created a mini garland of each character. Britni told a story with her tablescape, food and décor; her Wizard of Oz party blog offers extra details on each party element. This back to school party was both nostalgic, and a great way to celebrate embark on new adventures. Consider showing the film at your party to add to the fun! You can’t go wrong with milk and cookies, which is why this is such a yummy party to celebrate going back to school. Karen from Forever Your Prints whipped up the yummiest milk and cookies-themed party. With its simple color scheme of red and white with accents of chevron and polka dots, this party was darling. All of the printables including the cupcake wrappers and food labels are available for purchase on Etsy. The cookies looked too beautiful to eat! Katie’s Creative Baking and Fondant Flinger prepared the wide variety of cookies for this party. Karen served milk in glasses with her custom labels. For your back to school party, consider having a cookie decorating station so that the kiddos can get a little crafty! This party was such a yummy way to celebrate going back to school. Pac-Man, Space Invaders and Frogger–oh my! Celebrate going back to school with a fun-packed night of playing classic video games with family and friends! This video game-packed party was one to remember for both the kiddos and the adults. 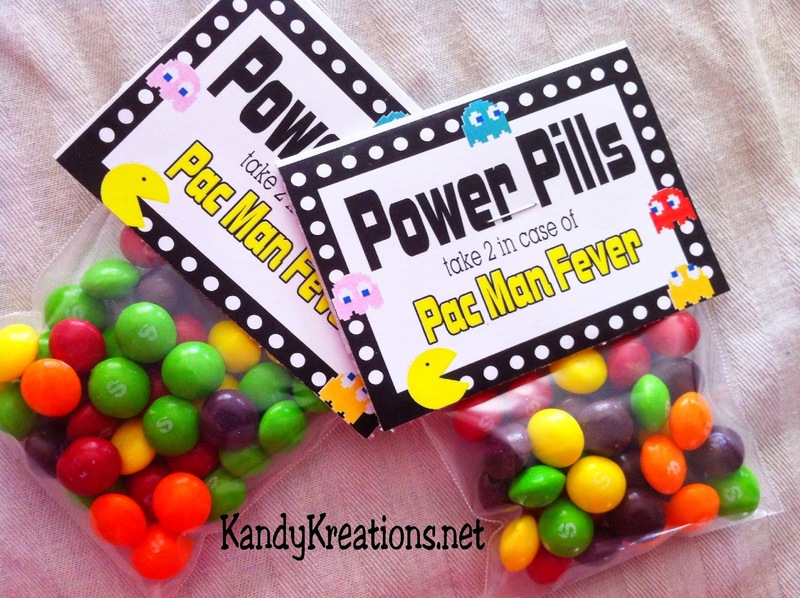 Kimberly from Everyday Parties threw a video game-themed party filled with lots of goodies and of course games! Since the party was based around games, the perfect location would be in the living room surrounding the TV. She cleared out all of their usual décor to prepare for the party. The decorations for this party were super easy. She found video game backgrounds from her favorite games and took them to her local store to blow them up to poster size and to top off the TV stand, and she hung a Pac-Man banner. 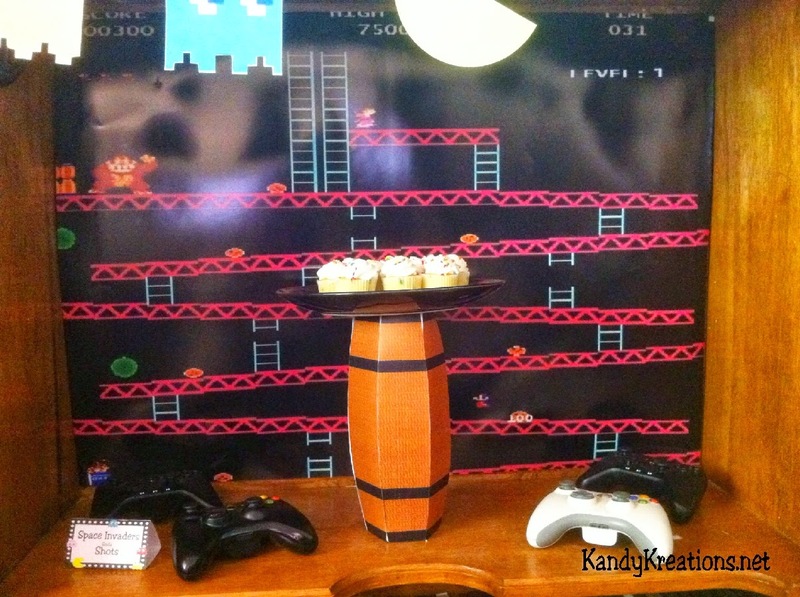 Inside each cubby of the TV stand, she incorporated a snack inspired by the game with directions featured on her video game party blog. This back to school party was full of retro fun and playing the games as a family will bring out the competitive side of us all. This back to school party is so magical. Julie partnered with Party Pieces to unleash her mystic power for her unicorn-themed party. Consider starting your party-planning magic with unicorn invitations that are sure to sparkle. 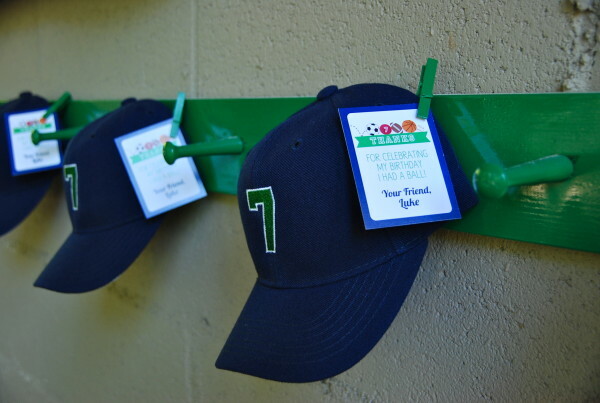 The basic design allows them to be repurposed for any special celebration. The decorations for this party were precious. Balloon arches are a big hit and a great way to great guests when they arrive. Use various sized balloons and colors to create your own. The food table was packed full of treats with a simple white tablecloth. Pale pink flowers were placed in the centerpieces along with skewers with paper unicorns. Julie hung a “We Heart Unicorns” garland to tie in with the theme. With all the energy from the sweets, make sure the kids have some time to horse around. Consider planning unicorn-themed party games like “pin the tail on the unicorn”. Your guests will also have a blast running around with their own unicorn horn party hat. This unicorn-themed back to school party was full of glitter and lots of smiles. If you have a unicorn lover in your house, then this is the perfect way to gallop into the new year. This back to school party is a blast from the past! These colors and details are reminiscent of a 50’s diner and we love every bite! The bright colors, poodle skirts, Coca-Cola and milkshakes all made us giddy with excitement. Heather and Jason from Hello My Sweet took us back in time with their 50’s diner party. This party was budget-friendly and cost less than $100 according to the decoration price breakdown featured on their 50’s party blog. The decorations for this party were very basic with white tablecloths and food labels made by Heather and Jason. They purchased a majority of the glasses and other props from their local dollar store. This get-together was an ice cream social with the added twist of Coca-Cola floats. It was a blast to hang out with all of their family without planning a super over-the-top party. Consider asking guests to come in their favorite 50’s attire to add to the fun! This back to school party is a STRIKE! Victoria from vixenmade parties threw a bowling-themed party after spending the night at the bowling alley with her family. The tablescape for this party had a very simple red and white color scheme with alley backdrop. Victoria loves to incorporate glass bottles and paper straws into her party décor. She looked for bowling pins to sit on the table but went more of the DIY route by spray painting glass bottles white and attaching red electrical tape to the neck. The food and sweets complemented the color scheme with chocolate covered Oreos decorated like bowling balls and layered jello to resemble pins. For this party, they tried out a delicious holiday punch recipe too! The décor was complete with a bowling ball she found at a thrift store and her grandmother’s vintage bowling shoes. Her family and friends had a blast going to the bowling alley and celebrating afterwards with the at-home party alley. All of Dr. Seuss’ books are so wacky and fun—kids have been reading them for years! This party from Cheryl of Moms and Munchkins was straight out of Whoville. 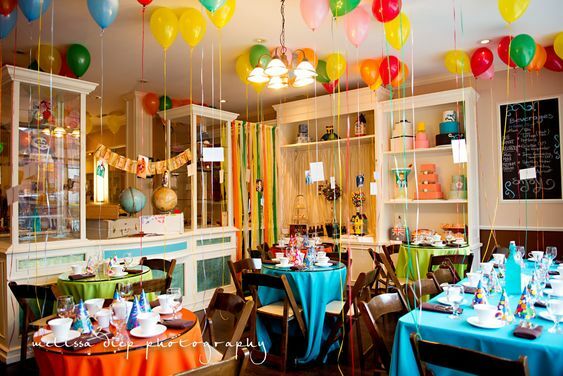 Cheryl’s inspiration for this party came from the Dr. Seuss books. She opted to use her party spaces (tablescape, food and décor) to tell a story. 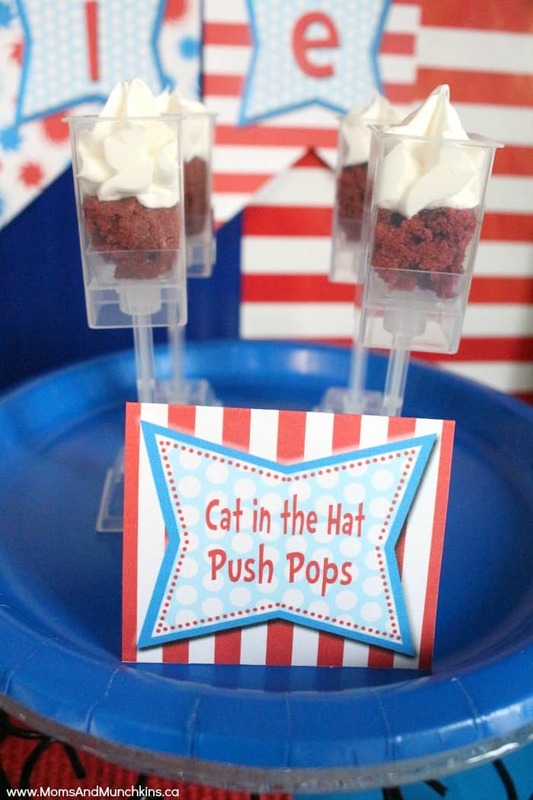 Her Dr. Seuss-inspired party blog offers quite a few details about her choices. All of the printables for this party were provided by Just a Little Sparkle. The primary color scheme was red and white, with a striped garland inspired by the Cat in the Hat. Since Dr. Seuss has so many wacky characters, decorating for this party can be personalized based on your favorite books and scenes. 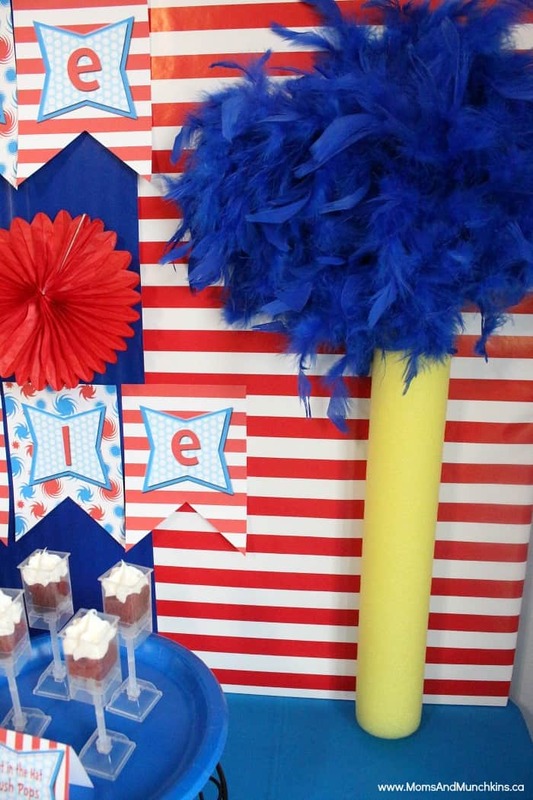 Other decorations for this party included red, white and blue paper fans and DIY Lorax trees made from feather boas and a pool noodle. You could also use paper towel holders covered in paper to create the tree trunk. A Dr. Seuss party wouldn’t be the same without wacky food and Cheryl went all out! An easy snack to serve for your guests comes from his most popular book, Green Eggs and Ham. Add some food coloring to your eggs and ham and your kiddos will go nuts! 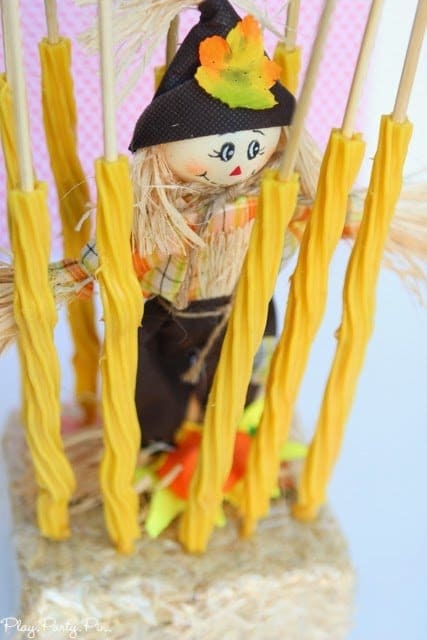 She also incorporated Wocket Pita Pockets, Hot Dogs on a Spool and more fun edible ideas on her blog. Don’t be a fool—going back to school is super cool! 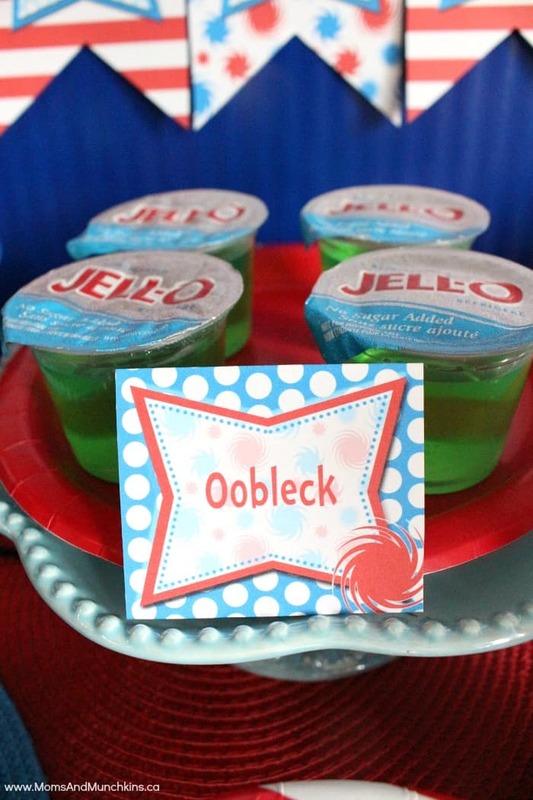 We loved every wacky bit of this Dr. Seuss-themed back to school party. 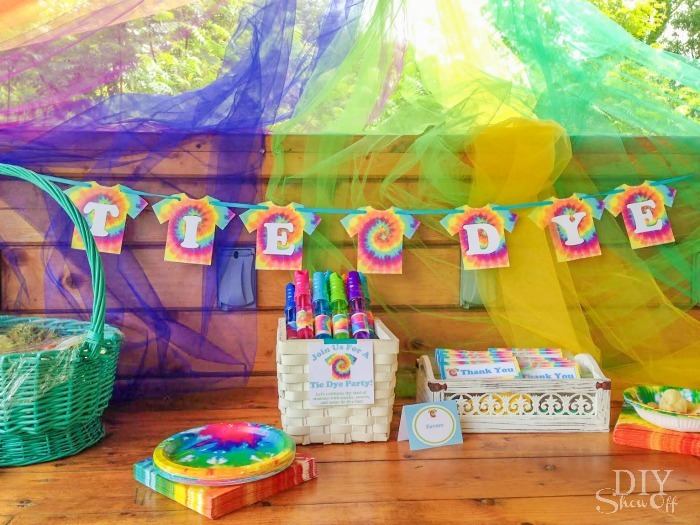 Celebrate the end of summer with a bright and vibrant tie dye-themed back to school party! Roeshel from DIY Show Off is one crafty chick with tons of easy-peasy activities and decorations from the tie-dye party she threw for her kiddos and their friends. This party was a one-stop shop for Roeshel. She purchased a tie-dying party kit from Tulip that included dye, gloves, kids shirts and party printables she utilized throughout the entire party. Each guest brought their own dyeable item, but she kept the extra t-shirts on hand. Roeshel said that she has never tie-dyed anything, so this party was a blast for her too! The decorations were mostly from the party kit, but she jazzed up the space using tulle from her local party store. This back to school party is a fun and easy way to get together with friends and classmates before heading back to school. This back to school party is toe-tally out of the box. 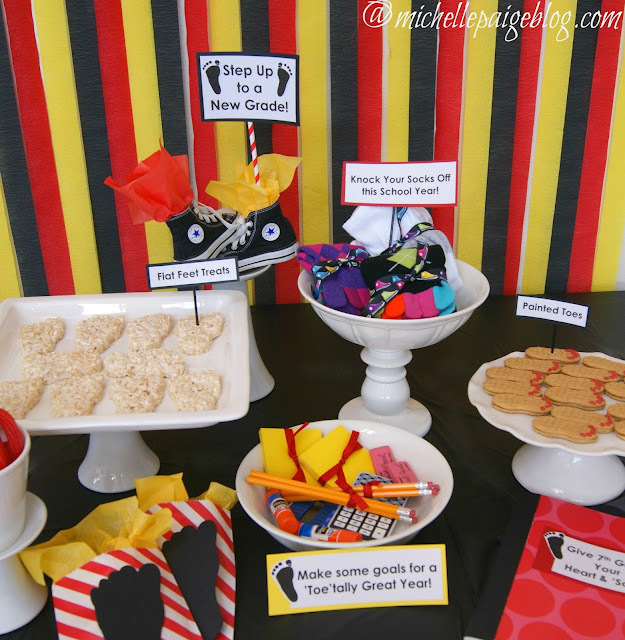 Michelle of Michelle Paige Blogs created a foot-themed back to school party to celebrate the new year. She incorporated high-top converse as a focal point and stuffed them with tissue paper to add a little flair. 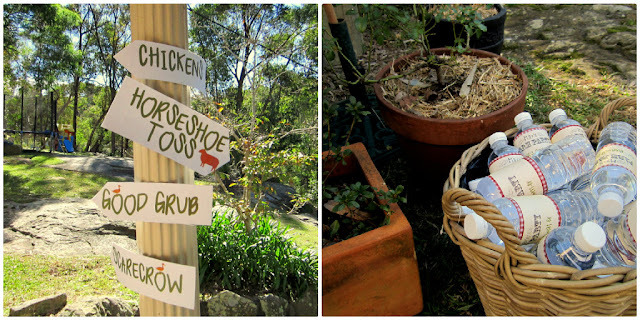 There are also several additional clever ideas featured on her foot-themed party blog. This back to school party is sure to “step up” your child’s game before heading off into the new year. We’re paying tribute to our roots in Indianapolis, Indiana, the home of the Indy 500, for this back to school party. Crafty mama, Genia, from Project Nursery transported us right to the Speedway with her racecar-themed party. She works in the vinyl decal business and created the racecar sign hung above the table. She also made the road using a table runner and attaching the white markers using a felt or similar material. She lined traffic cones on both sides of the road. The checkered flags and pennant banner take you right to the race track and are a definite must-have for this theme. Balloons are both a source of entertainment and easy way to add flair to any party space. Genia did both by scattering balloons around the room and created an arch behind the food table as a focal point. We’ve waving the checkered flag, as this is our final back to school party idea and we are sure it will be a hit as your kiddos race into their new school year or semester. Going back to school shouldn’t be a drag, rather a celebration of new beginnings, new journeys and lots of learning. That’s why we found over 60 fun and creative back to school party ideas to celebrate this upcoming year. But this isn’t even the start of it. We have 400+ more on Back to School Pinterest Board! We hope your kiddos have a great school year filled with lots of memories and even more knowledge! If you have any other awesome back to school party ideas you’d like to share, we’d love to hear about them in the comments below.